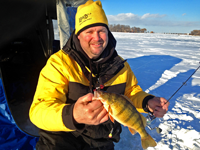 Ice Fishing Report December 31, 2013 Jeff Sundin - Move Over Walleye Fishermen - Itasca area panfish lakes are on the mend. On a mission to find a special place, for a special project, most of my day Monday was spent in the truck searching for a panfish hole. From Deer River to Blackduck, from Bemidji to Bowstring and everywhere between. My list of lakes was too long for my own good, I only looked at about half of them, but I liked what I saw. After being forced out of many early season panfish spots, it was a real treat to feast my eyes on some great looking ice. That's right, ice conditions have vastly improved on smaller waters and opportunities to fish for panfish are on the rise. In fact, I found three lakes yesterday that were virtually slush and snow free. Now don't go tearing off into the wild Blue yonder, thinking that I just sounded the all clear for every lake. You're still going to need to do some investigation and there are still lakes where slush problems persist. But it is definitely getting better all the time. One of the small, slushy lakes that we tried to fish a couple of weeks ago was now completely re-frozen and I walked out on hard packed snow, less than 2 inches deep. Another popular Sunfish Lake, somewhat larger and earlier this season, a complete disaster, was now slush and snow free. The water had wicked all the way to the surface and completely re-frozen solid. The only reminder of the "old days" were a few snowmoile tracks, now embeded as frozen trails above the ice. There are still problem spots, most of them exist on larger lakes or in areas where drifted snow is too deep to become saturated with water. Areas where the snow has not been disturbed will continue to cause trouble too until we get a more serious meltdown. Still, the stage is set for a steadily improving outlook on small lake ice conditions. So if you've been sitting it out on the sideline, polish up youor auger blades, tie on your Tungsten Toads and start moving toward your favorite Sunfish hole. Chances are, it's prettier now than it was the last time you looked. Ice Fishing Report December 30, 2013 Jeff Sundin - A Story Of Warmth That Defies All Odds! The temperature outside of my window right now is -27 degrees. Yes, That's right, Twenty Seven Degrees Below Zero and here I AM, writing a report about how the lakes refuse to freeze. If that's not another testamonial about the forces of nature defying logic, then I don't know what is. Do You? In case you missed the December 20, 2013 articles about why Grand Rapids area lakes have been so stubborn about generating some good ice this winter, you can catch up on the whole story here >> Lake Detective Confirms Theories About Stubborn Slush . Luckily, ice fishermen still have places to fish, we just have to root out the information about where we can and can't go. The rule of thumb has been that smaller lakes that have the deepest snow cover have been the most stubborn. Larger lakes are generally better, but recent developments on Lake Winnibigoshish have concerned rental operators. (12/30) Leech Lake Area Lakes, Gary Roerick Says; "Finally we have some good ice on some of our lakes in the Leech Lake Area. Walker Bay of Leech Lake continues to gain additional thickness in the ice arena and the slush is nearly nonexistent. Many of the other lakes continue to have serious slush and flooding issues. I still do not have fish houses on 10th Crow Wing Lake near Akeley. This lake historically sees permanent fish houses before Walker Bay does. This past week I tried to gain access to several favorite pan fish locations and I continue to encounter some difficult spots that do not allow ATV access to tow fish houses. I continue to fall through the first layer of ice and then settle in to a serious slush pocket that creates some unique challenges. We now have ice in the 10” to 17” category on many area lakes, including Walker Bay of Leech Lake. I continue to see flooding on most lakes that occur when people auger new fishing holes and then within an hour or two the entire area is flooded from the water that continues to come up on top of the ice. If you have a favorite fishing spot you may want to go to that area and drill a series of holes and then let it flood and freeze down so that you can place your fish house in that location. On Walker Bay most of my customers are catching 10 to 25 walleye per house per day, with two of the houses reporting in excess of 40 fish in one night. Many of the eyes’ are in the 10” to 17” category. At this point in time we are not seeing many fish in the slot or above the slot. 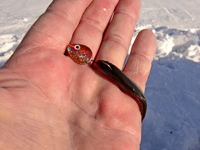 Leech Lake has a slot size of 18” to 26” that must be returned to the water immediately after they are caught. Garfield Lake continues to produce limits of northern pike each day along with many nice bluegills, occasional crappies and largemouth bass. If you would like to get involved in some awesome fishing action, give me a call at 218-760-8266 or email me at groerick@paulbunyan.net and I will set you up on one of my favorite hot spots! Don’t forget to take time with family and friends during this Holiday Season! There are many good opportunities to spend some quality time in sleeper fish houses in the Walker area! We wish you a Happy and Prosperous New Year!" - Gary Roerick Roerick Fish House Rentals 218-224-2836 . (12/30) An email from Andy Gabrielson; "Question for you: What do you use or recommend for GPS electronics for ice fishing? I used to use a XOXO, but it has broken. I have heard nothing but problems with the new XOXO and I like the LakeMaster chip. Whether on the wheeler, sled or pickup what is the best all around option in your opinion? A) Andy, over the past three or four years, I've run a series of Humminbird combo units, leading up to the HD 597 that I have now . In fact, you can see it in the photo from Red Lake article from 12-28. An interesting parallel, I used to use the same hand held unit that you mentioned. But over the years, my eyes have developed a sweet tooth for larger, brighter screens. Originally, the Humminbird 385 did the trick very nicely, providing a larger brighter screen and the convenience of having a single unit that combined GPS and sonar. I still have that unit and I wouldn't blink an eye to take it out and use it as my main unit right now. The ICE 597ci HD Combo though, as an ice machine, has been perfected. It all comes packaged in a single box that includes everything you need to be up and running in short order. I think it took less than a half hour to get my kit assembled and once the battery was fully charged, I was up and running. The larger screen is something that I really like and for me that's a key feature. But the 385 was miles ahead of that other unit and I'd be perfectly happy with that, if that's all there was. One feature that I know you will love about the 597 is that the internal GPS locks in fast and it doesn't need to be out in the open sky to do it. In fact, I was surprised by mine when it locked in while I was sitting in the sofa, preparing to download my GPS coordinates. Another feature that you will love about all of the Humminbird units is the "Quick Connect" mounting system. It works like a bayonet that allows you to switch the unit from one location to another. Lets say that you want to use it on your ATV, in your truck and on the ice. Just install an extra mounting bracket on the ATV and one in the truck. On your way to the lake, all you do is snap the control head off of the ice box and snap it into the truck. At the landing, snap it onto your ATV and in your shelter, snap it back onto your ice box. Your question about reliability could lead me into to a really long story. But let's just say that this was the reason that I switched to the Humminbird in the first place. I did some quick math and to date, I've owned a grand total of 9 Humminbird units. I still have never had to send a single one of them in for service. I'm not saying that nothing ever goes wrong, but for me, the reliability has been awesome. Finally, the ability to access all of the features and benefits of Lakemaster's charting tools makes the decision a "No-Brainer". Just yesterday, I used the 3D feature of my Contour Elite software to map out a fishing spot on a lake that I've never even been to. All I have to do is load it into the 597 and head for the landing. When I get there, I'll go right to the spot and drill two holes. It doesn't get much more efficient than that. Here are two links that will take you to a lot more information about the Humminbird ICE 597ci HD Combo and The Lakemaster Contour Elite software . (12/30) On Lake of the Woods, Border View Lodge, Mike Kinsella wrote; "We are situated in 32 feet of water and the action remains hot! We have had a great mix of Walleye and Sauger. Anglers are taking home limits of Walleye eating plenty while they are here. We have opened the plowed road today. There is 20 to 22 inches of ice out on the lake. For those that have been looking for the good ole fashion winter to come, here it is. Temperatures continue to be forecasted below zero for the week ahead." 1-800-776-3474 Border View Lodge . (12/30) From The Iron Range, Greg Clusiau; "Our plan of attack was to saddle up on the snowmobiles and make our way to a proven crappie hole, located a mile and a half away. Having guided on this magnificent water, I knew more than enough fishing spots for our crew but sketchy lake travel kept us fairly close to “home.” The snow had some depth to it but was no challenge to a snowmobile. It was frequent deep slush pockets that kept us from straying too far. In the “perfect ice fishing world”, where everyone would have their own snowmobile, it wouldn’t have been a problem in scooting around the lake but when most of us were “doubled up” you just ... " >> Read Greg's Full Report . (12/30) From our Facebook Page, in the Aitkin area, Jason Thomas wrote; "I know someone that was on Farm Island Lake on Friday and they said it is terrible, a good foot of slushy water on the ice with over a foot of snow on top of that.. he also said they dint see anyone out on mille lacs on the west side." (12/30) From our Facebook Page, on Lake Winnibigoshish, Gail Heig, Bowen Lodge; "We observed STEAM rising from the surface of Winnie, on Bowens Flats. Water coming up through the snow and hitting the colder air---freaky!!!!!" (12/30) From our Facebook Page, in the Longville area, Debby Hoel wrote; "Lake Wabedo in Cass County is much the same. Snow - water underneath and then Ice." By The Way; For Facebook fans, you can add your two cents worth too. Don't worry, you don't have to give up your secret spot. Just let us know if there's a trend in your area or drop us a line to brag about your great catch. Visit >> Fishing Reports Minnesota . (12/30) On Bowstring Lake, Erin at Geiger's Trails End Resort; "Ice is being made, slowly, but surely. We are finding 10-12 inches. However, there is still a nasty, slushy mess out there. We have had snowmobilers coming through our resort to access the lake. As of right now, we are NOT plowing the ice. It is still too dangerous to drive out. As for the fish, they are hungry and have been biting. This warm-up today is a great sign, but the temp will be dropping tomorrow, which might be good or ??? We'll have to watch and see." 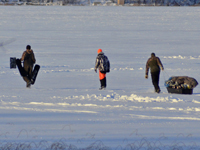 Trails End is running an ice fishing special that includes discounts for groups of 5 or larger. Click here to view >> Bowstring Lake Ice Fishing Special . - Erin and Bill Charlton, Trails End Resort . Ice Fishing Report December 29, 2013 Jeff Sundin - Cold Relief? Or Just Another Cold Slap In The Face? Two days of warm temperatures helped make conditions wet and sloppy on Grand Rapids area lakes. The snow compacted, anglers opened more territory, drilling new holes and a lot of that water saturated the snow. I Know, that doesn't sound good, but it is and had the warm weather persisted, we would have seen continued compression of the snow, more slush and an even brighter light at the end of the tunnel. Instead, we're heading back into the deep freeze and ice conditions could go either way. 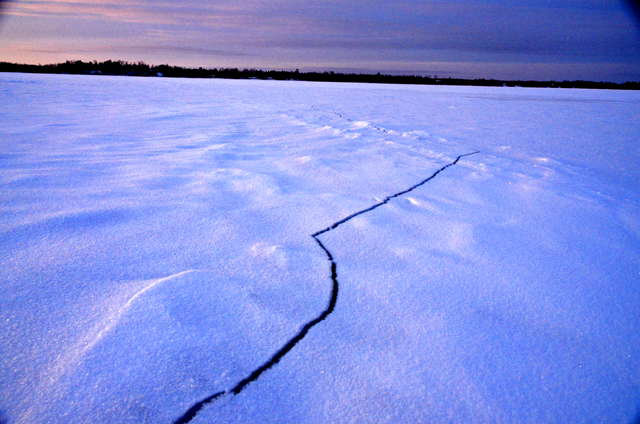 A 30 to 50 degree drop in daytime high temperatures will certainly open up new cracks in the ice. That means there will be more flooding and some access restrictions. Short term, that will stink; But in the end, it could be good. Maybe we'll get lucky and find out that this is Skadi's way of doling out justice. Because without significant, additional flooding, conditions are unlikely to improve. Snow will continue to insulate the ice and we'll be talking about slush for the rest of this winter. If conditions get wet enough, then we have a chance to get the needed re-freeze and our do-over of the ice fishing season can begin. Here's what came in yesterday. (12/29) An email from Doug Peterson, Grand Rapids, MN; Jeff, I saw your post about the Snap Cap and I want to get one for my auger. I can't find one around town, where can I go to buy one? A) Doug, I contacted Dan Houg, purveyor of Cold Snap and he provided a link to his website's "Dealer Locator". It's handy, just enter your zip code and select the distance and up pops the list. Just click here >> Cold Snap Outdoors Dealer Locator . (12-29) By the way, shortly after I uploaded the report, Bill Powell dropped me a line to let me know that he has 8 inch Snap Caps for both Strikemaster and Jiffy augers in stock at Fred's Bait Shop in Deer River. Note: Just in case you missed the original article; I re-posted the original image and a link in the right hand column and the original article below. (re-post November 2013) "You Know how I Am, always looking for that simple twist that makes life better. Well, check this one out, The Snap Cap, from Cold Snap Outdoors is something that you definitely need to get. In fact, I'll be putting these on every auger I ever get from now on. I met Dan Houg, purveyor of Cold Snap Outdoors at the Dakota Angler, Ice Institute and it's one of those handy gadgets that makes you slap your forehead, because you wish you'd come up with the idea yourself. His Snap Cap Auger Blade Cover is so simple, but so effective that I think it's just a matter of time before we're all gonna have one. Just click here for a Snap Cap video demonstration and more information. (12/29) An email from Joe Stevens, Grand Rapids, MN; Jeff, I remember talking with you about light weight fishing rods last summer. You told me to get a 4XXX pole? But what lenght of a pole should I get? and was it 4 or 6 lb. test line? Thanks Jeff and hope to see you next year. - Joe Stevens (Stevens Magic) . A) Joe, I remember the conversation and as I recall, we were talking about lighter weight rods that would provide a good balance between Walleye and Crappie fishing. I don't recall the exact one we talked about at the time, but here are a few options. Let's start with your last question first. For early and late season jig fishing, I have all of my rods equpped with 4 pound test line. All of the rods that I've been using lately are between 6'4" and 7 feet long and are relatively fast action rods. These days, all of the "better manufacturers" have the ideal range of lure and line weights printed on the rod, located near the handle. When you're shopping for a rod, focus on the models that provide the balance of line and lure weights that most closely match the presentations you fish most often. For me, jigging rods usually have to help me cover the territory between 4 and 12 feet of water. For that, lure weights of 1/16 to 3/16 ounce work best. That's whay I use the light, 4 lb test line. It allows me to work with light baits, pushing the limit of how deep thay can be fished. At certain times, we've successfully fished in 30 feet of water using only 1/16ounce jigs. For Walleye, Crappie and Perch fishing, TFO's TFG SSS 662-1 has been working out really well. They're 6'6" and handle 4 to 8 pound line, 1/16 to 1/4 ounce lures and at a price of only $99, they're darn hard to pass up. I bought 4 of these last year as my standard all purpose "go to rods" and pass them out to all of my customers. For Crappies and shallow water Walleyes, St. Croix's PFS70LXF is a 7 foot rod that's rated for 2 to 6 pound line and lure weights of 1/16 to 3/16 ounce. These are delightful rods for fishing Crappie and under the right circumstances, I use them for Walleye fishing too. They're a little on the light side for deeper water Walleyes, but when we're teasing them out of the shallows, this rod is perfect. At $120, it's in the right price range too! If you want to spend a little more, St. Croix's LTWS70LF is good finesse rod that has you covered for both Walleye and Crappie fishing too. This one rings in at about $250 and crosses into the high territory, but it will get results. If the sky is the limit and you won't settle for anything less than the best, then I don't believe that you'll ever find a better rod than Gary Loomis' original SR842-2S GLX. It's expensive, $390 but for me, there has never been a better 7 foot, light weight rod produced. One Caviat, these rods are the ultimate in terms of sensitivity, but the trade off is that they can be broken. If you get one of these, be protective and use it, don't abuse it. Ice Fishing Report December 28, 2013 Jeff Sundin - Minnesota's Big Lake Walleyes On The Prowl - Welcome Relief For Slush-Weary Pan fishermen. Remember the old saying; "Go With The Flow?" Well I can tell you from experience that going with the flow is a key ingredient in any successful fishing adventure. So after struggling to find slush free fishing spots on my favorite early season panfish lakes, it's been clear that moving in another direction is a good idea. That's why I couldn't say no to an invitation from my friend Jon Thelen to spend a "Fun Day" on Upper Red Lake. On their way to a weekend hockey tournament in Bemidji, Thelen, his son Nate and their friends Jim and Nate Amoe had made plans to arrive a day early to spend some time on the other kind of ice, chasing Walleyes on Red Lake. Legendary Red Lake Guide, Jonny Petrowske was scheduled to join them too. Bundle that all together and it was an offer that I couldn't refuse. We got an early start from Deer River and arrived in Washkish around 8:00. After the group put up with a couple of SNAFU's, caused by me, we were finally on the ice, following Jonny P. to one of a thousand spots on the giant lake. When we arrived at the spot, he pointed, we drilled and that's where we stayed. We set up our portable shelters and never left the area until we were wrapped up. Petrowske had us positioned around some scattered rocks and mixed sand. The fish were milling in and out of the rocks and within a few minutes we were seeing fish on our locators, catching some, being teased by others. Using the old reliable Rattlin' Flyer, I'd caught and released 3 or 4 Walleyes in 20 minutes. But after a while, I noticed a lot of lookers, few of them being takers. For me, the action really heated up when I switched from the aggressive jigging presentation to a much more subtle presentation. Almost dead-sticking, but not quite. As anglers, we often get intrigued by a fishing lure's ability to "Do Something". Sometimes we forget about a lure when it comes time to do nothing, or close to it. Enter the Foo Flyer, typically thought of as a search lure, it is a jig that can do a lot. But it also has an uncanny knack for triggering strikes by doing nearly nothing, giving the appearance of a naturally feeding baitfish. It all started be I wanted to fish a dead stick, but I didn't want to take time to rig a bobber. Knowing the the Foo Flyer would sit horizontally in the water, I could rig one up, then use a rod rest. All I'd need to do was watch the rod tip for signs of a pickup. I tied on a 1/4 ounce, Golden Shiner color and tipped it with a medium size fathead minnow. Once I had that rod positioned, I tied a 3/16 ounce, 360 jig on the other and jigged that aggressively to get fish into the area. Sometimes the fish came in fast and just smacked the 360 jig. But the ones that didn't were subject to a healthy dosage of persuasion. By gently wagging the rod tip, I could make that Foo Flyer move in a tiny arc and I think it appears to be a feeding minnow. Using this bait, I was able to convert about 7 out of 10 lookers, into biters and I had a blast doing it. There are a couple of tricks though; The Foo Flyer is designed to be fished with either a whole minnow or with artificial tails. Be sure that you have the minnow or plastic tail rigged nice and straight. That will allow you to get the maximum triggering power. Also, when you get a strike, remember that you're giving the fish a large offering and allow them plenty of time to engulf the bait before setting the hook. If you treat your strikes just like you would when using a jig and minnow in summer, then you'll hook most of the fish that strike. By days end, our little busman's holiday turned out pretty darn good. We all needed a nice warm day and some sunshine, we got that. I'm not too sure how many fish we all caught, but it was plenty and I didn't count all of the smiles, but there were a lot of those too. We'll have to do that again some time. (12/28) On Lake Winnibigoshish, Grant Prokop, fishing with his customers Sam Sparen McKeon and Roberts, found a great Walleye bite too. Assited by Grand Rapids fishing guide Reed Ylitalo, the team searched Lake Winnie's mid-lake structures and found a school of active Walleyes. Prokop said that the structure topped out at 24 feet and that the fish cruised in an out for most of the day. Jigging spoons tipped with minnow heads was the best presentaion and the typical morning and evening pattern was best. There were periods of daytime action too, Prokop speculated that maybe it's because of snow cover. Snow and ice conditions on the lake are good for snowmobiling, few if any slush problems exist for the lightweight machines. There is a little bit of truck traffic on the lake, but it is very limited and still not recommended. Reed Ylitalo chimed in with a few words of his own; "Today was a great day for fishing and also catching. We found a few big jumbos and a nice mess of keeper walleyes. With the keepers we threw back 7 walleyes that were over the 17 inch mark and also two lake Winnie pike. We fish the edge of small structure all day the guys had a blast!" Ylitalo also warned about trying to travel by truck on the big lake; "We also saw a half ton truck moving a wheeled house. That truck got stuck multiple times, not recommended." (12/28) On Lake of the Woods, Zippel Bay Resort; Most of the fishing action is now in 22 to 28 feet of water, in the area from Zippel Bay to about 3/4 mile West. On certains days, anglers are doing a lot of sorting, but it's typical to expect several nice Sauger in the 14 to 15 inch range, mixed with Walleye in the 16 to 18 inch range. There are some fish shallower during the early morning and evening. Anglers could expect to fisn fish in the Twin Tree area at depths of 15 to 17 feet of water. Northern Pike fishing has been very good in the shallows, 5 to 8 feet has been their key depth. By the way, The Zippel IGLOO is open. Zippel Bay Resort 800-222-2537 . 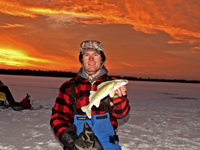 Ice Fishing Report December 27, 2013 Jeff Sundin - Did Somebody Say Red Lake Walleyes? - Remember the old saying, "You Gonna Talk, or Fish? HA! Well, I'm not doing much talking today. Because I'm not in the office. In fact, by the time most of you read this report, I'll already be wetting a line on Red Lake. We'll call it a busman's holiday, we're not officially gonna be working, but I do feel a photo shoot coming on. Of course, that means that you'll get the full update, first thing in the morning. In the meantime, if you can, get outside and enjoy what promises to be a great day! (12/27) Gus Sheker, Gus' Place Resort on Ball Club Lake; "Lake conditions are getting better and better every day. The fishermen who are unencumbered by the physical weight (and maybe the monthly payments) of the modern day Wheel Houses have been fishing area lakes for as much as three weeks now!! These are the guys who are running the ice on ATVs and snowmobiles sheltering in light weight portables. No roads are necessary for this great early ice season and they are not confined to the shore waiting for the ice to be safe at 16 inches. Ball Club Lake has 11-12 inches of good ice with 5-6 inches of packed powder. Most of the slush has turned to ice except a small band along the shoreline, but that isn’t a problem for those getting out. The cold is making ice at an average of about 4 inches a week, so another 7-10 days and we should be near safe ice for trucks; Maybe. We are setting out the spearing houses this week, so if you would like a cabin for the night and a spear house give us a call ( 1-888-246-8520) we can shuttle you out if you do not have a ATV or snowmobile. Most of the fishing action has been in 6-12 feet of water for Perch & Northerns. Walleyes are deeper 18-20 with the best bite early or late for the Eyes. - I will be updating as the conditions change. HAPPY NEW YEAR EVERYBODY." - Gus Sheker. Gus' Place Resort . (12/27) From Cutfoot Sioux, Eagle Nest Lodge - Bryan Harris said; "Gunnar (Harris) was out on Cutfoot for a couple hours yesterday and found a good foot of ice. It was decent ice, with about 8" of snow on top. No slush where he was! Things are looking up." For anglers with ATV's or snow machines, Cutfoot Sioux provides plenty of ice fishing opportunities for Walleye, Crappie, Perch and northern Pike. Eagle Nest Lodge has 3 large log cabins open for the winter, the fish cleaning house is heated and for ATV's and Snowmobiles, the access to the lake is very good. Eagle nest Lodge 800-356-3775 . 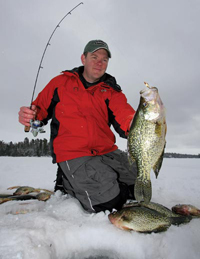 (12-27) Catch More Crappies On Crowded Waters - Daniel Quade; "Visions of icing slab crappies seldom include crowds of anglers. More often, sweet dreams of icy nirvana center on remote backcountry waters or hidden gems that somehow fly under the masses’ radar. However, while untapped fisheries can be dynamite, you can also enjoy banner catches on waters besieged by the bucket brigade. Panfish fanatic Paul Fournier knows the drill. Years of practicing his craft on hard-hit lakes sprinkled across central Minnesota’s Minneapolis-St. Paul megatropolis have left him well versed on tackling pressure-cooker crappies. His finely tuned tactics include a blend of pre-trip recon and refined fishing strategies to ice slabs that elude other anglers. Read Article >> Ice Fishing Pressure Cooker Crappies . Ice Fishing Report December 26, 2013 Jeff Sundin - Did Somebody Say Fishing? - That didn't take long! By the time I drove home from Crookston, unloaded the truck finished cooking dinner, my cell phone was already buzzing with texts. They were images of fish laid out on the ice in flattering poses and they were fresh, only minutes old. Austin Jones didn't let a little wintery weather get in his way on Wednesday. In fact, not long after leaving from our Christmas visit to Crookston, the proverbial "screen door had barely finished hiting me in the ..." before my soon to be son in law, hit the ice for a Christmas afternoon ice fishing trip. Fishing on an Erskine area lake, Jones said that he set up his portable shelter on the breakline; "One side of the house was in 18 feet, the other side was in 22 feet". Walleye were located near the bottom, just above the 22 foot mark. Crappie were suspended, holding about 12 feet below the surface. The fish were active between 5:00 and 6:30 PM and struck aggressively on a Pink & Chartreuse Frostee Jig and minnow combination. (12/26) Fish Ed. 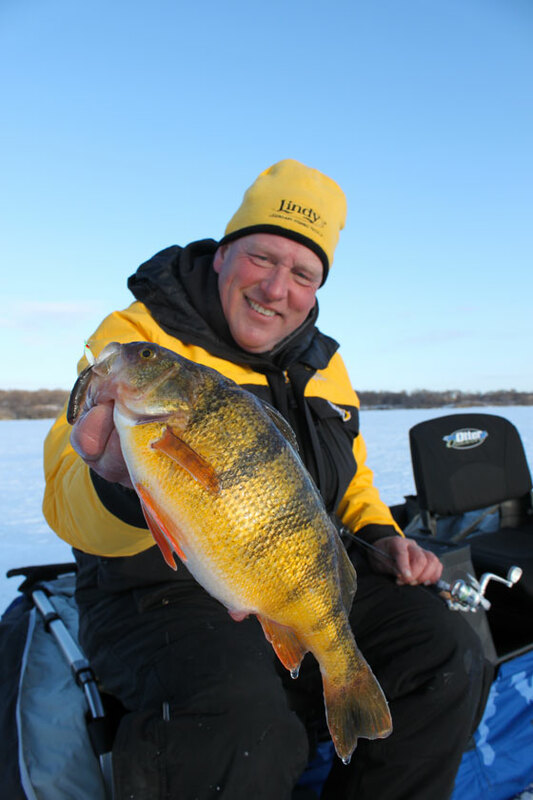 Ice Fishing Tricks to Catch Devils Lake Perch - "This week on Fish Ed, Jason Feldner stands in for Jon Thelen and brings you to Devils Lake North Dakota in search of giant jumbo perch. Jason shares presentation and location tips for early winter jumbos which are sure to help you catch more fish. This is an episode you do not want to miss!" Click to view >> Tricks For Catching Devils Lake Perch . Ice Fishing Report December 24, 2013 Jeff Sundin - Good Morning! - There aren't many people or places in this world that could make me skip a day. But there are a few and today, one of them has. So after extensive contract negotiations; The lakes, fish and ice have all agreed to allow a little extra slack in the line, just enough to let me escape for a few hours. Ice Fishing Report December 23, 2013 Jeff Sundin - Time To Put Out The Hard House! - There are a lot of guys saying that the conditions are too crummy for ice fishing right now. I KNOW! Sometimes it's so easy to fall into that trap! If you give 'em half a chance and the glooms and dooms will try to outweigh the sunny side ups every time. But Ice conditions are improving every day and if you snoop around a little, you can find a spot. Even when you think there isn't one available on your lake, there could still be one sitiing right under your nose. A good friend of mine has a really cozy, warm, ice fishing shelter. It's perfect for weather like this and I wouldn't mind spending an afternoon out there. The only problem is that it's up to me to put it out on the lake and I haven't gotten around to doing it yet. Over the past few seasons I've moved it around a little, never placing it into the exact perfect position, but somehow still managing to find something "good enough for us guys". This season, I already know that there's a pile of slush in my routine territory and until we pack down a trail, that area won't work. Yesterday afternoon though, I noticed a snowmobiler who was getting around just fine by staying closer to the shoreline. That's been the pattern on all of these smaller lakes. You can walk out nearly 100 yards on seemingly good ice, then take one magic step that lands you into the soup. Well what if I find a new spot, closer to shore? We'd talked about moving that house into new territory anyway and I thought that this might be a good excuse to do it. Except for one thing, no one really has time to go out and drill a bunch of holes to figure out where to place it. NO WORRIES! I have a secret weapon! I went to the computer, fired up my Lakemaster Contour Elite, dialed in the lake, zoomed into areas close to the shoreline and picked a suitable looking spot. What caught my eye was slow tapering point that on one side, leads up into a shallow, weedy feeding flat. On the other side, a tapering breakline that leads smack dab into the lakes deeper, main basin. I pinpointed a spot that lies right along the breakline, almost at the edge of an inside corner, but still on the tip of the point. Once I had my idea pinpointed, I used the 3D feature to help visualize the structure from several angles. That will help ensure that I drill my holes in the right spot, the first time. Now all I need to do is to export that spot onto an SD card, plug that into my Humminbird and I'll be able to drive right to a location that just could be perfect; We now have a good shot at Walleye and Perch in the shallower water, plus Sunfish or Crappies in the deeper water. (12/23) So will it work? Most of it already has! The tools have done their job and now it all boils down to my judgement about that location. It's an educated guess, but one that allows me to have a darn good chance at catching some fish on the first try. One thing that I Do Know, you'll be getting the straight, un-filtered story tomorrow! 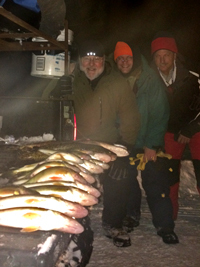 (12/23) Leech Lake Area Lakes, Gary Roerick Says; "Merry Christmas and Happy Walleye Fishing! December 22, 2013 - The ice continues to get better, especially on Walker Bay of Leech Lake. Measurements of ice thickness on Walker Bay are now in the 9” to 14” category. The ice profile is made up of primarily white colored ice and not clear blue ice on most of Walker Bay. When Walker Bay froze over at the end of November, and then we had well over a foot of snow during the following week, the entire snow profile sunk the little ice that was on Walker Bay and the bulk of the ice is water saturated snow that froze. This particular bed of ice is not near as strong as clear ice that would be solid water. I was also on another smaller lake this past week that had several layers of ice with approximately 3” to 5” of water between the two layers. I busted through the first layer on about 10 different occasions until I finally quit trying to place one of my sleeper houses on a favorite pan fish location. I pulled that particular sleeper house back to the landing and parked it there to try again the next week after the current slush layer freezes up. I now have sleeper fish houses on Walker Bay of Leech Lake along with houses on several other area lakes. Give me a call on my cell at 218-760-8266 if you would like to book one of our fish houses for your next fishing adventure! Customers and friends continue to spear limits of northern pike and they are catching lots of pan fish during this past week. Next week I will be able to report how the walleye bite is on Walker Bay of Leech Lake since we have lots houses rented out over the Holidays! Continue to exercise caution while exploring new fishing locations this winter. Ice conditions will continue to be marginal in some areas because of the heavy snow that is now on many of our area lakes. Slush conditions will prevail on most lakes for weeks to come. Enjoy the upcoming Holiday Season with family and friends! A trip to your favorite fishing spot can make the Holiday gatherings complete! - Happy Holidays!" - Gary Roerick Roerick Fish House Rentals 218-224-2836 . (12/23) On Lake of the Woods, Border View Lodge, Mike Kinsella wrote; "The action continues! We have moved around again this week. We have houses from 19 to 28 feet of water and have been in some great action. Your favorite jig is working. Many different thoughts on what works best and it seems as though each angler is able to work their favorite bait the way they like to produce Walleye and Sauger. Still keep in mind that gold and glow red are the preferred colors. We are gaining more ice although we have not yet plowed a road. Four Mile Bay is still a little thin for full size vehicles. We are hoping it will be later this week. It appears that December will go out the same way it came in! Temps continue to be below zero and overnights hitting the -20 mark. We are looking forward to a great holiday season and wish everyone the same!" 1-800-776-3474 Border View Lodge . (12/23) Ethanol and Outboards - Do you really know what kind of gasoline to use in your outboard engine? There is much confusion regarding the effects of ethanol-blended fuels on marine engines and fuel care products in the market. All gasoline, whether it’s blended with ethanol or not, will degrade over time due to evaporation, contamination and oxidation, according to Brian Kluge, Mercury Marine’s director of parts and accessories. However, ethanol can exaggerate this. This is a full length, feature article that tells you everything you need to know about the gas you're putting into your engine. Click >> Ethanol and Your Marine Engine, What You Need To Know . (12/23) From The Iron Range, Greg Clusiau; "We chose to set up my Clam Outdoors X2 as it was rather windy and cold. I wanted to have a safe place to be able to take pictures of any fish that we had to release so they would not freeze and potentially die. Finding that the weather was just to unbearable, we chose to fish in the comfort of a warm thermal house with a buddy heater, which provides more than enough warmth. The best presentations we found were to dead-stick a... " >> Read Greg's Full Report . Ice Fishing Report December 22, 2013 Jeff Sundin - Good Morning! And Welcome To The First Day Of Spring! - With the winter solstace behind us, each day will be just a little bit longer than the one before. That allows each one of us a few extra minutes to soak up this gorgeous Spring Scenery! (12/22) Wait! Maybe you missed yesterday's report? No, I did not fall off of my rocker or off the deep end either. If you don't know what I'm talking about, you can go right to the top. The Grand Poobah, of the Royal Order of the 21sters, Joe Soucheray. Joe can explain it a lot better than I can. Here, just click this link and find out why this is the first day of spring. 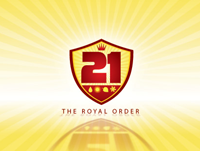 >> The Royal Order Of The 21sters . (12/22) On A Number of Grand Rapids Area Lakes, advice from the gloom and doom crowd about thin ice and slush maybe falling on deaf ears. While everyone is ringing their hands about how crummy the ice conditions are, a handful of enterprising ice fishermen are taking stock of a theory that I advanced a few days ago. Deeper, clear water lakes have the best ice conditions in Itasca County right now. It's likely to stay that way too, at least until we ... Read Grand Rapids ice Fishing Report . (12/22) On Bowstring Lake, Bowstring Shores Resort, Darv Oelke says; "I have a road plowed out about a mile to perch point. I did that earlier in the week. today I went back to check it. And 2 out of the 3 slush spot where frozen. Where I plowed earlier in the week was 13 inches. And where I did not plow was 8 to 9. So right now I do not recommend any travel on the lake . I did talk to 3 fisherman today. Not much to speak of. And they tried 3 lakes and 2 of them all they got was stuck for 1 1/2 hours the said. So we will see what happens next week. they say more snow. If that happens it could be all over for the big fish houses. BUT let us just wait and see what happens in the next week. I have been talking to a few fisherman and I have not heard 1 lake that is safe all over. So we have a road for ATVs and snowmobiles today Lets see what mother nature brings us tomorrow." - Darv, Bowstring Shores Resort . Ice Fishing Report December 21, 2013 Jeff Sundin - Higher, Dryer Ice Conditions and A Fun Day On The Horizon! - Don't you think it's funny about how nature works? While we spent countless hours speculating about how things are gonna work out, nature just keeps on truckin'. Somehow, we wind up on the right path, at the right time, even when we don't know how we got there. Last year, we began winter by wondering if there would ever be enough ice to get out onto the lakes. This year, we began winter by thinking that there would be so much ice that we wouldn't know what to do with it all. Either way, the report from December 21, 2012 is almost the same as the report for December 21, 2013. Okay, not exactly the same, but really close. On Friday, I decided that the best idea was to follow my own advice and steer clear of the really small lakes and take a look at some of the deeper, late freezing lakes. I already had a pretty good idea that this was gonna work because I'd seen some large areas of shiny, Grey ice from the road. It was gorgeous outside and I probably should have loaded the snowmobile, but after enjoying a few too many brushes with slush last week, I figured that I'd be better off checking the ice first. I would walk as far as necessary to prove that I'd found a suitable fishing spot for today and THEN load up the gear. So, that was the plan and that's how it turned out. I took a short drive and a good long walk. What I found was mostly excellent ice conditions, maybe the best I've seen so far. I walked probably a mile, on high, dry ice that was covered by snow ranging in depth from 1 to 4 inches. I still can't give it the total "Green For Go" because I purposely headed for one of those large Grey patches and there I did hit my first pocket of slush. In that area, I did break through the crusty surface ice, discovering slush that was about 4 inches deep. Until we get more snow, these Grey areas are easy to spot, so we can steer clear of them. Hopefully, they will be fully re-frozen before we get the next heavy snowfall. There were a handful of fish houses out there, an ATV and a few snowmobiles too. I didn't see any sign of a struggle near any of them. Today, I'll plot a course that allows me to try a few spots that are well away from those Grey spots and with luck, maybe even catch a fish. (12/21) Ryan Peterson just checked in from Lake Winnibigoshish with good news too; "From the South end of the lake, we are sitting at 12 inches of ice, more in some areas. We're using a light truck to keep a road plowed out to the first breakline." Ryan added that he's be checking ice conditions further out on the lake today. He is hoping to have the V-Plow and larger truck on the ice by Tuesday. - Ryan Peterson's Guiding . Ice Fishing Report December 20, 2013 Jeff Sundin - Walleye Fishermen, More Encouraging News! Yesterday, I mentioned a couple rules of thumb about which type of lakes I thought best to target for the up-coming weekend. (click to Jump Back, 12-19 Fishing Report ) . In my heart, I thought that my theories made a lot of sense. But knowing that you don't have a lot of time to run around searching for the right lake, I thought I better get a second opinion, just to be sure that I don't send you on a wild goose chase. But who could I ask? Most of the fishing folks I know would have just added another layer, piling on with theories of their own. No, I needed something more, I needed an expert. That's when it dawned on me; What about LD, The Lake Detective? He's never been stumped. As a long time listener of Joe Soucheray's "Garage Logic" radio program, I'd become familiar with Steve McComas, AKA the Lake Detective. McComas, the purveyor of Blue Water Science, a Twin Cities based, fresh water consulting firm. LD answers the call to solve the puzzle whenever there's a lake mystery in the area. Joe says that LD has never been stumped. Luckily, I managed to track him down and LD agreed to read my musings and critique my thinking. I was eager to read his email, but admittedly, expected to be corrected, maybe even dressed down a little bit. It turns out that I wasn't all that far off, but LD added a dimension that I hadn't realized. It's about how the water gets between the ice and snow in the first place. It's not necessarily the weight of the snow that weighs the ice down. There's another factor that McComas called differential ice contractions. There's a temperature difference between the surface ice that contacts the air and the underlying ice that contacts the water. With air temperatures colder than the water temps that the ice is sitting on, the ice sheet takes on a concave shape. The edges of the ice fall down causing ice fractures (or cracks) and that is how lake water gets on top of the ice sheet. Lake water will either refreeze or create slush, depending on snow and air temp conditions. Thank You LD and Good Luck! (12/20) Gus Sheker, Gus' Place Resort on Ball Club Lake; "Over the past week we picked up 3 more inches of ice on the lake in front of the resort, putting us at 9 inches and more on the South end. There is 5-6 inches of packed snow on the ice with visible areas of gray slush in the middle of the lake. We are seeing some snow mobile & ATV traffic around the rim of the lake and light portable shelters as well as small one man fixed day houses around the rim of the lake. As far as the “fishing report,” well sorry guys, there just haven’t been many people fishing yet to get enough information to write about. In looking at my personal almanac; conditions are about average for this time of year and it won’t be long before the guys who like to drive their pickups out will be on the ice. The light rig fishermen are already busy on most of the lakes including Ball Club Lake. I will update next week." - Gus Sheker. Gus' Place Resort . 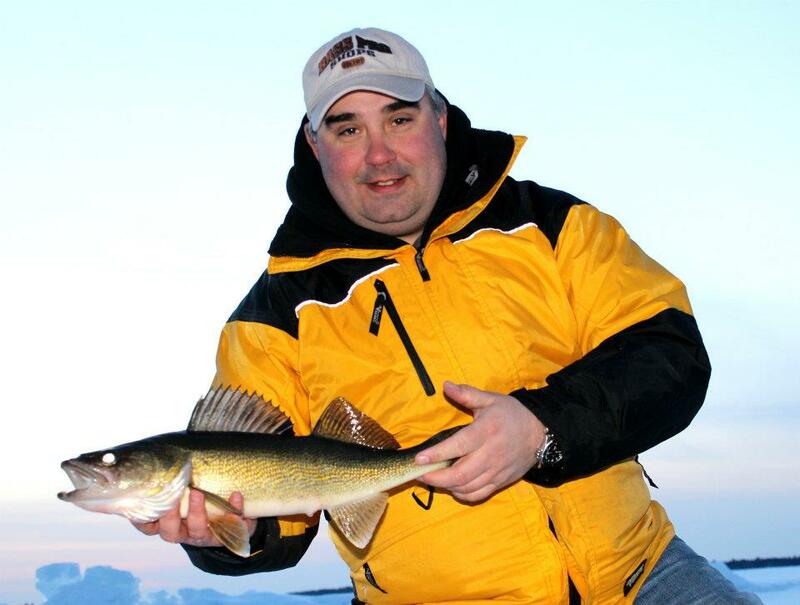 (12/20) Early Ice Walleyes On Lake Of The Woods, was Jon Thelen's mission for this week. Early Ice on Lake of the Woods? Hey, I've told you before, it's one of those spots ya just gotta visit! Jon Telen shows why in this video. 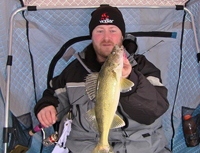 Click >> Early Ice Fishing Walleye on Lake of the Woods . (12/20) On Bowstring Lake, Erin at Geiger's Trails End Resort; Reported finding a fairly large crack developing between their resort ramp and the deeper, main lake basin. Depending on how fast the crack heals, this could be a short term delay. But just to be safe, they're going to refrain from allowing public traffic out from their ramp. The ramp will be closed to all traffic including ATV's and Snowmobiles until the ice can handle the traffic. - Erin and Bill Charlton, Trails End Resort . (12/20) Bold New Fishing Boat Shows its Rebellious Side - For over half a century, the legends at Lund Boats have done things just a little different than everyone else. They’ve earned patents for multiple fundamental hull designs, innovated radical seating and interior layouts, plus conceived many of the critical fishing features and technologies in use today. In short, they’ve gone where no other boat manufacturer has. It’s this very legacy of free-spirited thinking that has resulted in Lund’s newly redesigned 1800 Rebel XL. >> Learn More about Lund Boats 1800 Rebel XL . Ice Fishing Report December 19, 2013 Jeff Sundin - Walleye Fishermen, More Encouraging News! Wednesday's calm, sunny conditions were inviting and long over due. The picture perfect day helped spur another wave of traffic onto Grand Rapids area lakes. Many of them, showing up in unexpected places. I shouldn't be surprised because lately, I've noticed how hard it is to get through a day without learning something. And yesterday was no exception. At first glance, my theory doesn't make a lot of sense, but once you think about this, I think it will begin to sink in. The trend right now is that some of the best ice conditions are being found on deeper lakes. The ones that froze late and barely had ice thick enough to support foot traffic before the snow fell. Apparently, these lakes must have flooded almost immediately after the snow fell. The weight of the snow made the ice sag, allowing water to saturate the snow faster and more thoroughly. The denser, water soaked snow was able to freeze more quickly, allowing the ice in these areas to heal. Another circumstance where anglers can expect to find better ice, is in the wind swept areas of the larger lakes. On larger waters like Leech Lake, Winnibigosh and Lake of the Woods, the wind has helped thin the snow cover. It was easier for cold temperatures to break through the thinner barrier of insulating snow and heal these areas faster too. What makes the least sense, at first, is that most of the smaller Grand Rapids area lakes that froze the earliest, now have the worst conditions in terms of slush and water on the ice. I guess that on these lakes, the ice was already thick enough to easily support the fluffy, dry snow. Add to that, the air temperatures were very cold during the snowstorm and have remained cold ever since. In other words, it was easy for the snow to remain light, fluffy and deep, perfect insulation. I think that's why these lakes didn't flood right away. the snow didn't settle because it's remained so dry. That means we're stuck with a double whammy effect. Because the deep, fluffy snow is providing maximum insulation. It's not only protecting the surface ice from the cold air above, it's also holding in the warmth from the underlying water. So if the heat can't escape and the cold can't get in, the slush just keeps on lingering. The upshot for ice fishermen in the Grand Rapids area for right now? We're all probably better off looking toward the larger lakes, along with a handful of deep water lakes that froze later, instead of searching for small lakes. (12/19) On Bowstring Lake, Erin at Geiger's Trails End Resort expanded on the report from yesterday about getting started with the plow to begin building the road out onto the lake. She dropped us a line on the FB Report Page with an appeal to area ice fishermen that says; "Just so we are clear about the ice conditions on Bowstring. We've heard that there has been some talk about people driving on the ice. There was one, it was someone driving a pickup on Bowstring Lake. That driver was lucky, but the problem is that we still can't count on the ice to be ready for traffic. In our opinion, the ice thickness is still too variable and NOT safe for full-sized vehicles. We are asking that people give it just a bit more time before driving (vehicles) on it. Believe me, we are chomping at the bit to get out there too! But there's plenty of time, so hold off just a little while longer and with a little bit of patience, we will ALL enjoy a GREAT season on the ice." - Erin and Bill Charlton, Trails End Resort . (12/19) Leech Lake Area Fishing Guide, Grant Prokop wrote; "(On Wednesday) Leech Lake had about 8 to 9 inches of good ice and 3 to 4 of bad ice. There was some pockets of slush but not a problem for a sled or tracks. I saw a track machine haul about a 16 foot house out of whipolt beach and make it out without a struggle. There is a pressure ridge to watch though, that ridge runs out of diamond point that heads west out towards huddles reef." Prokop adds that there were lots of fish, presumably Walleyes showing up on his electronics. The fish were not exactly aggressive, but he was able to catch a couple of Walleyes before leaving the lake. (12/19) On Lake of the Woods, The report from Sportman's Lodges; "Macho Minnows, stop signs, 3/8 oz gold/pink jigs and white tackle on sunny days tipped with a frozen shiner is really working well jigging in 21'-25' of water! 100 fish days have been the norm since we started our season a few weeks ago. (12/19) Ryan Peterson checked in from Lake Winnibigoshish with good news; "Things are looking good on the south end of Lake Winnie we have between 11 and 12 inches with very little slush, it won't be long now maybe even this week and we can put a light plow truck out. I do have one small house out now and a 3 person going out tomorrow, I still some openings for Dec 26th to New Years so any one looking for a great sleeper fish house rentals get ahold of me you might just get a great Christmas / New Years deal." - Ryan Peterson's Guiding . Ice Fishing Report December 18, 2013 Jeff Sundin - Ice Fishermen, Look Toward Big Water For Encouraging News! After spending the past few days searching for slush free places to fish on small water. It would be easy to conclude that The Itasca Area lakes just weren't ready for prime time. On Tuesday, we did actually get onto some decent ice on one small lake. We got some holes drilled and even caught a couple of Crappies and Sunfish. Still, heavy slush prevented us from getting to all of the spots we wanted to try. Our day was cut short by a lack of access to good fishing spots, at least the ones I know about. It could have been easy to get discouraged, especially if this was later in the season. Luckily though, it's still really early and the weather could throw us a curve to the left at any time. The better news started flowing when I began hearing from folks who have properties on larger lakes. High winds have done a better job of clearing snow away from the surface of the region's more expansive lakes. That's given the cold temperatures an easier shot at healing slushy spots and at forming new ice. It may not be time to sound the Bugle Call To Arms. But if you've been chomping at the bit, ready to wet a line, it's a step in the right direction. (12/18) Bemidji Lakes Area, Paul A. Nelson, Bemidji Area Lakes Guide Service says; "Anglers in the Bemidji area are still waiting for the ice conditions to improve. Temperatures below zero will eventually have an impact on the slush, but it takes a very long time when there is as much snow as there is on the lakes. Resorts on Upper Red Lake and Lake of the Woods are trying to get roads plowed on the lakes, which should help make the ice on the roads thick enough for vehicle traffic soon. The ice is still less than a foot in most areas on both lakes, so they are taking it slowly and making sure there is enough ice before opening the roads. A wide track snowmobile or some other tracked vehicle is the best way to access the lakes right now. Even snowmobiles get stuck if anglers drive through too much slush and there is also a risk of freezing up the track when temperatures are as cold as they have been. Most of the lakes closer to Bemidji are covered with about 18 inches of snow and only 6 to 8 inches of ice, which is not enough ice to support the snow. If anglers can make a trail on the lakes, the snow will compact and the ice will freeze more easily on the trail. Most anglers that are putting fish houses out on the lakes are doing so close to an access or in front of their lake homes, so they don’t have to travel too far on the ice. Anglers wanting to explore new lakes or travel further from shore really have to be careful and check the ice conditions constantly until they have established a safe trail. It is also very important to travel in pairs or as part of a group, to minimize the risk. Anglers should come prepared to get unstuck, bringing shovels and tow straps to play it safe." - Paul A. Nelson, Bemidji Area Lakes Guide Service, panelson@paulbunyan.net - 218.759.2235 . 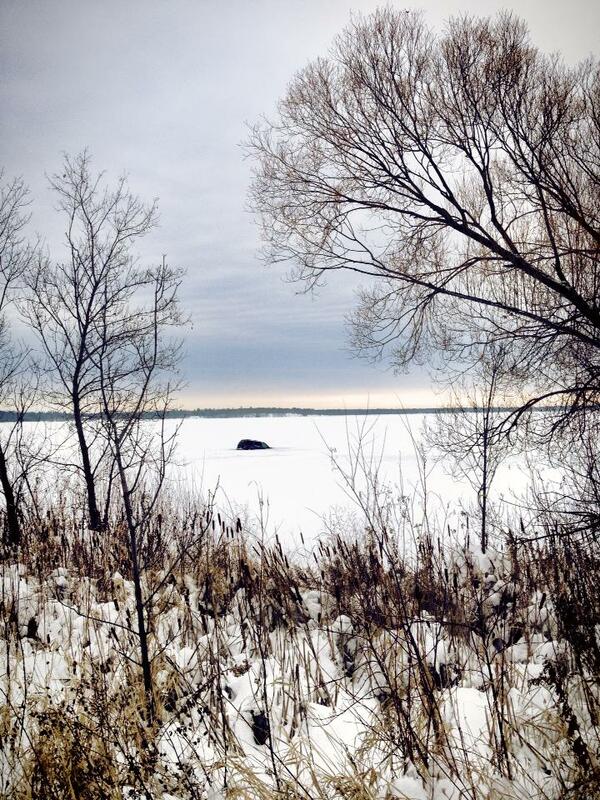 (12/18) Leech Lake Area Lakes, Gary Roerick Says; "Ice, some slush, more Ice! - Mother Nature is healing all lake surfaces! As we stated last week, we just need to let the process work and give the ice some time to develop. This past weekend I was able to check out the ice on 4 different lakes and the ice is thicker, the snow has settled dramatically, and much of the slush has solidified. Yesterday, with my Polaris Ranger, I drove several miles across a myriad of those lakes and in most of those travels I was not driving in standing water nor did I fall through the first layer of ice in to the slush pockets. Don’t take home the wrong message though, there is still slush on all area lakes and I believe that this will be another one of those winters where we will deal with slush pockets all winter long. If you pay attention to the snow surface and monitor the snow conditions as you are walking and/or driving an ATV, you can visually see out in front of you as to where the slush pockets are located. You will see a different, slightly darker, color in the snow texture, you will see where the snow has settled more in some areas than in other areas, and you will see actual little holes in the snow profile where the water had come up and now it looks like an old fishing hole, or similar to a hole that you may have seen on a small lake or pond that an otter would use for an air hole. More good news, we now have ice in the 8” to 11” category on many of our smaller lakes. Yesterday I did visit with several fishermen on Walker Bay of Leech Lake and they stated there is 4” to 6” of good ice in the area that they fished. I would think that we will see ATV’s on Walker Bay later this week. It was nice to drive down to the landing to see about 10 cars in the parking lot, and a cluster of small flip and fish type shelters close to shore trying their luck on the elusive walleyes. The first fisherman that I talked to had one nice walleye in his bucket and he was heading home for a fresh meal of walleye! My goal is to put several of my sleeper houses out on area lakes this week. My customers in the spear/angling houses this past week did really well, with most spearing limits of northern pike and at the same time, catching lots of bluegills, some crappies and an occasional largemouth bass." - Gary Roerick Roerick Fish House Rentals 218-224-2836 . Ice Fishing Report December 17, 2013 Jeff Sundin - OH OH! Changing Ice Conditions Pose Problems. A setback for the Itasca Area ice fishermen developed on Monday. The warmer temperatures might feel better on your face and fingers, but as the weather warmed, the ice has expanded causing the formation of new cracks and pressure ridges. On Lake Winnibigoshish, areas that were nearly healed and on the virge of supporting light vehicle traffic are now filled with slush. Conversly, areas that froze late and looked really questionable a couple of weeks ago, are improving. Likewise, smaller lakes are tricky too. On Monday, I and Bill Powell did our best to find a lake where we could access some panfish. Hoping the the deep freeze had improved conditions, we loaded up our snow machines and headed for a couple of popular panfish lakes. We never wet a line. In spite of snow that doesn't seem that deep and in spite of the super cold temperatures, slush remains a persistent problem. For the moment, I'm almost as stumped as anyone else, but I have learned one thing. If I'm going to catch some panfish anytime soon, I'm gonna need to hoof it to the spots. Any other plan is simply too un-reliable at the moment. Walleye fishermen do have more options and there are new opportunities on the verge of opening up. I've talked with some rental operators who have house in place, but are waiting to open. They want to be sure that conditions are safe before opening the flood gates. Watch for updates, there are changes in the works and coming soon. (12/17) From The Iron Range, Greg Clusiau (Courtesy Tom Batuik); "I made it without incident to the spot I wanted to fish. Along the way I noted several deep slush pockets that would hang me up if I slowed down or stopped in them. I chose to put the pin to my Bearcat and run over top of them back to the truck. With my trail made I would wait for it to freeze overnight and then head to my spot on the next day. I went out and had a stellar afternoon of fishing like I often do on the pristine water of Rainy Lake. As such I chose to stay until dusk to return to my truck and then the short ride back home. After packing up I got underway. During the heat of the day some of my trail that I had made the day before had softened to the point where it was actually dangerous to travel rather than make new trail on top. I was about 6 miles from my truck when the sled got stuck. It was 8 pm and I was alone.... " >> Read Greg's Full Report . Ice Fishing Report December 16, 2013 Jeff Sundin - Ice Conditions Vary, But Improving - Without stepping too far out on a limb, I think it is safe to say that conditions are improving for Itasca area ice fishermen. So far, the sub zero temperatures haven't been too encouraging for anglers who like to fish small waters using portable shelters. But, give them the first sign of warmer weather and they'll be out in force. On Sunday, I noticed that slush, in certain areas has been re-freezing and that anglers are finding their way back out for a Do-Over of the early ice opener. On Moose Lake, I spotted a snowmobiler who had towed a fishing shelter onto the ice. Both the sled and the fish house were sitting high atop the snow and the path out showed no visible signs of trouble along the way. A group of young anglers were hoofing to their fishing spot and they too were walking effortlessly on top of the crusted snow. On Deer Lake, I noticed that someone had cut themselves a spear house hole. The slab of ice laying on the surface was about 6 inches thick and it looked fairly good. The problem is that the hole was cut in the area that froze early, before the heavy snow. Further out on the lake, ice had only formed a couple of days before the snowstorm. Out there, ice thickness is only a few inches and there's slush on top of that. Use extreme caution out there, even if you're walking. Anglers with the "Big Rigs" are showing up in big numbers on both Lake of the Woods and Upper Red Lake. In fact there are a couple of rental operators expressing concern that the onslaught may be happening too fast. 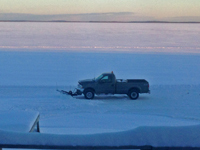 (12/16) On Moose Lake, I spotted a snowmobiler who had towed a fishing shelter onto the ice. Both the sled and the fish house were sitting high atop the snow and the path out showed no visible signs of trouble along the way. A group of young anglers were hoofing to their fishing spot and they too were walking effortlessly on top of the crusted snow. (12/16) On Upper Red Lake, certain areas are filling up with wheel houses fast. So fast that the ice might not be ready to support all of them yet. Even the most optimistic reports about ice conditions concede that at best, there's a foot of ice in the good areas, less in others. That's fine if you want to drive a truck, but parking 500 wheel houses in a relatively small area? That could be pushing it. That said, some of the better rental operators have their houses in place, but they're not promoting it yet. They feel that for safety, their plan is best, they are waiting for the ice to get a bit more reliable before they turn on the Green light. The upshot of the story is that you should go ahead and fish if you want to. But it's a good idea to move away from the giant crowds. Play it safe, find your own territory and you'll be fine. (12/16) On Lake of the Woods, Border View Lodge, Mike Kinsella wrote; "Incredible numbers this year! We are now starting to see more big fish move in. We have our houses spread out from 17 to 24 feet of water and all of those depths are doing the same. We are having the early ice action with phenomenal catch rates, this past week anglers were catching over 30 fish per person per day. With 14 inches of ice on the lake and 10-11 in the bay we are still using the light vehicles and have not yet plowed a road. It looks like we have a chance at 1 whole day above the zero mark. Tomorrow is forecasted to be above zero then it looks like we will be back below zero for the rest of the week. KFAN’s Billy Hildebrand was here this past weekend and had a great trip. He had a chance to experience Lake of the Woods for the first time. He caught a ton of fish and created some memorable moments with his two boys. It was also great to hear from our old friend Terry Tuma! The first of two winners of the KFAN deluxe fishing equipment package is Tom Savard from Woodbury. Not only did he win the prize but it must be his lucky day as he caught and released a 28 inch Walleye just before the drawing. I see a mega million ticket purchase in his near future." 1-800-776-3474 Border View Lodge . (12/16) I hate to sound like a broken record. But the Snap Cap, by Cold Snap Outdoors is something that you definitely need to get. In fact, if you have an ice fisherman on your Christmas list, this is one gift that I guarantee will be a hit! Cold Snap's Auger Blade Cover called the "Snap Cap" is so simple, but so effective that I think it's just a matter of time before we're all gonna have one. The Snap Cap won't slip off, you won't lose the strap, you won't even get your fingers cold and it's guaranteed for life, not to break. See it in action for yourself in this short video >> click here for the Cold Snap Outdoors Website . Ice Fishing Report December 15, 2013 Jeff Sundin - OOOpsie! - One way to get a sudden change in plans is to have your equipment break down. I got a repeat lesson on that subject yesterday when I pulled the snowmobile trailer into the driveway and discovered that one of the tires was flat. No big deal, just switch to the spare tire, right? Oh Oh, that was the broken one, the one hub with the stripped lug screw. I knew all about it, in fact, I had made an appointment to take to the repair shop a couple of weeks ago. That repair session was interrupted by the snowstorm. I had to use that appontment to repair the plow truck instead, I could move snow for 3 days. The trailer repair was re-shecduled for next Monday, except that the trailer didn't make it that long. With a busy schedule fast approaching, I couldn't wait another week to get it fixed, so I decided to climb underneath the rig do it myself. Well, there is no way to make the story short, so instead, here's a high speed re-cap. Couldn't remove wheel to repair tire because of stripped lug screw >> Removed hub assembly instead to repair lug screw >> Discovered bad seal, worn hub and damaged wheel >> Headed to town, picked up new tire and hub assembly >> Got home, back under trailer and realize some parts are missing >> Go to store, get more, wrong ones >> repeated as needed until job is finally completed at 6:30 PM. Hmm... cut the fishing time a little short. LUCKILY FOR ME, the whole episode happened before I got out of the driveway. Just think, I could have done all of that in the ditch somewhere instead! Whew, that was lucky! (12/15) Spoon Feeding Winter Crappies - Crappie anglers have a variety of lure styles from which to choose in their quest for winter slabs. Common picks include various horizontal hangers, which are perfect for tipping with waxworms or plastics, and vertical teardrop styles that work so well with a variety of lively minnows. But few crappie hunters consider spoons their go-to lures, especially under tough-bite conditions. That’s a shame, because these metal masterpieces work wonders throughout the hardwater season. One of my first epiphanies on spoonfeeding crappies came when I ... read full story >> Spoon Feeding Winter Crappies . (12-15) Ice Fishing Taken To New Heights! I got a kick out of a fun video from the folks at Humminbird. Kenora, Ontario, based guide Dave Bennett, an ice fisherman in a bush plane loaded with the Humminbird 597 and his fishing gear. They say; " It's analogous to a fighter pilot flying the F-35 Lightning, USAF fifth generation fighter. With these tools, it turns hamburger into steak, there are no unknowns, and the fisherman can hunt and score big against any species of fish." Bennett uses the 597 to locate his GPS coordinates from the air and then plops down to catch 'em. It's a fun video, just click and view >> Humminbird's Bush Pilot Crappies . Ice Fishing Report December 14, 2013 Jeff Sundin - Ready Or Not, Here We Come! - It's not exactly a heat wave, but starting off the morning at 0 degrees with 0 wind sure does feel good compared to what we've had lately. That means that I'm heading for the lake today, so I hope you won't mind if I cut this a little short. On Friday, I talked with Bill Powell at Fred's Bait. Traffic has been increasing at the store over the past couple of days, but most of the ice fishermen are heading further North. Upper Red Lake and Lake of the Woods are both productive right now and that's kept the focus away from local lakes. My tour of the area confirmed that there is little, if any traffic on most of the Itasca areas lakes, especially the smaller ones. On a loop from Deer River to Squaw lake, I steered clear of the big water, looking instead at possible locations where I could fish for Crappies or Sunfish. The most traffic I saw on any lake was 3 anglers. They were fishing on a popular Crappie spot on a little lake. Although the road into the lake was not plowed, they had managed to drive into the landing by truck. From there, they hoofed it out onto the ice with portable shelters. Virtually all of the remote gravel roads leading into small waters remain un-plowed. Most have un-used since the recent snowfall. But a few had seen a couple of trucks and several others had been visited by snowmobilers. I walked onto to a couple of lakes and found that hoofing it is gonna be a chore. Snowmobiles will be the way to go, but in the interest of safety, I decided that I'd better wait until I have a fishing partner along before I go onto the ice with my sled. Just in case. (12/14) Ice Fishing Rods and gearing up for the ice fishing season - You may recall reading my comments last December about my discovery of TFO's ice fishing rod lineup. At the time, I was looking forward to taking them out and giving them a thorough test. For me, the ice rods passed the test with flying colors. In fact, it lead me to purcahse a half dozen more TFO's for the open water season. (12/14) On Upper Red Lake, Walleyes are still active on the shoreline. Rental operators on the South end of the lake are reporting 12 inches of ice and some, if not all of them are plowing roads. So far, roads are limitied to the shoreline breaks in 8 to 10 feet of water. Troughout this weekend, the road system will expand and by mid-week, owners of wheelhouses will have access to most areas. 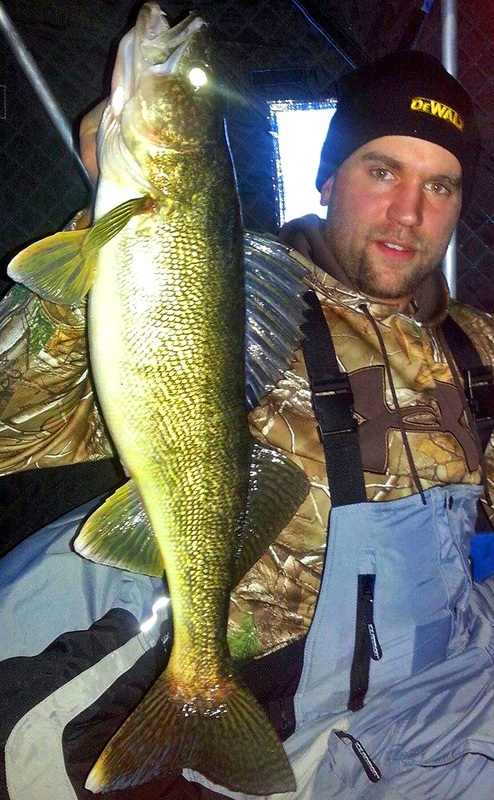 (12/14) On Lake Winnie If Walleyes sound like more fun, early reports from Winnibigoshish are good. Mid lake structures, bars, humps and deep points are producing during early morning and evening. Key depths are 18 to 26 feet, jigging. According to comments from my friend Arne Danileson, who is out on the lake doing creel surveys for the DNR, travel by snowmobile is just about the only way to go. There are a few anglers using ATV's, but that will be tough going if you move away from any of the small, user developed paths. (12/14) Buzz about Lindy's 360 Jig continues to heat up. Thanks to Jon Thelen who's been out on Devils Lake putting it to the test. There's a new video, hot off the press, that shows how to use the 360 Jig. Click here >> How to fish Lindy's 360 Jig . (12/14) Keep Those Fishing Pictures and Reports Coming! And By The Way, for all of you Facebook Fans, try using my FB Page >> Minnesota Fishing Reports . Ice Fishing Report December 13, 2013 Jeff Sundin - Cooperative Fish Make Putting Up With Snow Worth The Effort - It's a good time to be an ice fisherman with a snow machine in the Itasca area. Deep snow is holding back the production schedule for making ice, it's too soon to plow roads on the big lakes and for most of us, walking on small lakes lakes is a struggle. On Thursday, I took a walk myself and although it was doable, it wasn't a lot of fun. Not knowing what to expect, I hadn't packed up my gear so the walk was short, I spent just enough time to decide what I would do today. Here's the plan, for me. Panfish are more interesting than Walleyes during these early days and since I know that slush will be a problem on the deeper, late freezing lakes, I'm gonna concentrate my effort on shallow water, early freezing lakes. The rule of thumb is that the earlier they froze, the less likely they are to be affected by the deep snow. So I will be looking at the map, picking out a handful of spots that provide shallow water, early ice and panfish. Once I've narrowed it down to a half dozen spots, it will be time to fire up the sled and take it for a test ride on a couple of them. Ice Fishing Report December 12, 2013 Jeff Sundin - Ice Conditions Improving - But apparently not fast enough for some anglers. (12-12) A Red Alert from Lake Winnibigoshish claims that there was a light truck that went through the ice on either Tuesday or Wednesday. After checking with several people at Winnie, the report appears to be true, although the details are still sketchy. There's no Brass Ring for being the first truck on the ice, Play It Safe! According to the Minnesota DNR, it takes 8 to 12 inches of ice to support a car or small pickup truck. While there are certain areas on Lake Winnie that have 10 inches, there are still many areas that do not. Right now, snowmobiles are the best mode of transportation on Winnibigosh. Some anglers are making their way out to dark houses and portable shelters using ATV's on "User Developed" roads or trails. But venturing away from these small paths with anything but a snowmobile is tricky at best. A word to the wise; There are rental operators chomping at the bit to get their shelters out there and roads set up. They will know when the ice is reasonably safe and until you see them out there, don't assume that you're smarter than they are . (12/12) Remember the Spottail Shiner debacle on Lake Winnibigoshish? You may recall that the DNR slapped an outright ban on trapping all minnows on Lake Winnie last spring. You can get back up to speed using this link to the original article >> Spottail Shiner Harvesting Banned On Lake Winnibigoshish . Last spring, there were assurances by the DNR that there would be "studies" about how minnow harvesting by licensed bait dealers could safely be restored. Apparently those studies hit a dead end, a road block or something. Because to date, the bait dealers most affected by the ban, have not been included in any official study by the DNR. Ryan Fox (Winnie Trading Post) and Bill Powell (Fred's Bait) teamed up to produce a video that illustrates the complete minnow harvesting process. They take you on a full tour from the lake to your bait pail, allowing you to see every stop those minnows make along the way. Take a few minutes out of your busy day and check out the video >> Spottail Shiner Harvesting on Lake Winnibigoshish . (12/12) Introduces New App For Astute Anglers - "Underwater camera category leader Aqua-Vu recently unveiled an amazing new video-enhancement app that automatically transforms footage from cloudy and unclear to sharp, vibrant and rich. Looking Glass™, the new technology and app, filters and clarifies any video clip in one simple step. The result is akin to flipping a light switch in a pitch-black room. Initially available for the Apple iPad, Looking Glass is now offered as an app for ..." >> Read Full Report . Ice Fishing Report December 11, 2013 Jeff Sundin - Anglers Are Slow To Explore - After the storm, fishermen who had been chomping at the bit to get out on the ice, took a breather. They are starting to snap out of the doldrums and show up at the bait store, at least that's been the story at Fred's Bait in Deer River. When I talked with Bill Powell on Tuesday, he said that there were a few anglers moving their houses onto area lakes. Powell was anxious to re-visit the ice himself. He was hoping that he and Billy Maki might pick up where they'd left off. Just a day or two before the storm hit, they'd been out on a Deer River area lake where cooperative fish had helped get their season off to a great start. My own tour of the area revealed a dramatic slow down among local anglers. The lakes are very quiet now, with only a few ice shelters placed near shoreline fishing spots. Snow, deep enough to cause concern about deteriorating ice conditions, along with a general lack of enthusiasm for sub zero temperatures has encouraged most folks to hold off for a couple of more days. Good news is where you find it though and in spite of the trouble spots that exist, there are places where ice conditions are good, right now. The flow of information has already picked up and I anticipate that we'll hear about a new "hot spot" every couple of days between now and Christmas. (12/11) Gus Sheker, Gus' Place Resort on Ball Club Lake; "It’s that time of year again when we are all eager to get out on the ice for the first time this winter and try out some of those new jigs we just bought and maybe catch a few fish. Early ice on Ball Club Lake always means variable ice and conditions. The South end of the lake is the shallow end and it is always the first part to freeze. The South end can freeze 10-14 days sooner than the main body of the lake and always has the thickest early ice. Right now it is around 8 inches thick on that end of the lake. In front of the resort the water is deep to near 100 feet and the ice is 5 inches with less in the middle of the lake. We have 4-6 inches of snow on the lake and the areas of slush have frozen with the current cold weather. These areas are gray and visible. If you are headed out on Ball Club Lake we recommend; walk out with caution. - I will be updating reports on a regular basis." - Gus Sheker. Gus' Place Resort . (12/11) On Bowstring Lake, Erin at Geiger's Trails End Resort; "Just a quick update for everyone about the Northwest Side of Bowstring. Bill tried to start plowing on Tuesday, but there are about 6 inches of slush lying beneath roughly 18 inches of snow! For now, it is NOT safe to drive vehicles on it. We are goping to let mother nature work on it and we will try plowing again after the weekend. Stand by for updates as they become available." - Erin and Bill Charlton, Trails End Resort . (12/11) Working with Wired2Fish; "Booyah and Yum want to offer 6 readers the opportunity to have an arsenal of umbrella rigs and components to test for themselves. Included in each winners package will be everything you'll need to get set up to master the art of umbrella rig fishing. To learn more and enter, click >> YUM BOOYAH W2F Giveaway . (ends 12-17) . (12/11) On Upper Red Lake, Greg Clusiau dropped a quick note; "Upper Red Lake was hot last weekend in spite of the sub zero temperatures. Talking with Bear Paw Guide Service last Sunday night, Steve Brasel said there’s 12" of ice and they will be moving rental shelters out onto the lake during the week. The best depth for catching fish last weekend was still close to shore in 9' of water." (12/11) Ryan Peterson checked in from Lake Winnie too; "Going out from Denny's Resort on the South end of Winnie, we found that the ice is slush free, all of the way out to the deep water breakline. Ice thickness as of Tuesday was 10 inches." - Ryan Peterson's Guiding . (12/11) On Lake of the Woods, From Sportman's Lodges; Ice Fishermen are out on the lake and catching fish. According to the folks at Sportman's, the snowfall at Lake of the Woods was lighter than what other areas received. They reported; "We did get some snow, about 8-10 inches on the south shore and 5 inches up at Oak Island and the Northwest Angle. Will this affect the ice? In a sense yes, it will slow the building down a bit, but we do not anticipate it slowing it down very much. It sounds like we did not get nearly the snow as most of the state. We measured that we made an inch of ice within the past 36 hours. Most of the snow has been blowing around the past few days. There are areas with 3 foot drifts and areas with bare ice. Like always we have a few slush spots and areas of caution, but we do every year. That is normal. Rest assured we check ice at least a few times daily and safety is always our first priority. If you do plan to venture out on your own, we suggest making sure you know where you are going and staying on marked trails. We have 11-12 inches of ice were we travel and fish from the south shore (Sportsman’s Lodge Rainy River location) at this time and making more as I type, the thermometer currently reads 5 below and the week ahead looks like we will get a lot of the same! Our Oak Island property reports 4-8 inches of ice. They plan to open up soon. 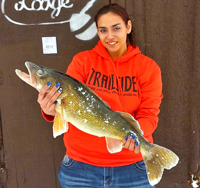 The past few days we have started to see in increase in the number of good eater size walleyes and saugers caught. More saugers have been in the 10”-14” range and real nice walleyes in the 16-18 inch range. Along with the walleyes and saugers our sleeper house division has reported a few eelpout mostly in the 24” -31”size and white fish in the 14 inch plus size have been reeled in. The best walleye and sauger bite has been found in varying depths between 26’-31’. Sunny days have been best. Jigs with gold on them or glow in the dark, and stop signs tipped with a minnow head have been working well. We have 27-32 inches of ice in the areas we travel and fish right now." - Sportman's Lodges, Lake of the Woods . (12/11) Bemidji Lakes Area, Paul A. Nelson, Bemidji Area Lakes Guide Service says; "The ice conditions and the bitter cold have been the main topics for anglers in the Bemidji area. The lakes weren’t ready for the heavy snowfall last week, but the bitter cold that followed the storm may have saved a few of the lakes from the worst case scenario. Many anglers are waiting to go back on the lakes until after the temperature moderate a bit. Once anglers are ready to go back on the lakes, the best ice should be on the lakes that had the most ice before the snowstorm. Upper Red Lake and Lake of the Woods both had about ten inches of ice when the snow hit, so they should have less slush than the lakes that had less ice. Lakes south of the Bemidji area had less snow than the lakes to the north and east. Anglers have been finding a few walleyes on the shoreline break of most lakes, with mid-lake structures usually more suspect for ice. Most anglers are fishing close to the access points, to avoid having to travel a great distance across the ice. Anglers fishing Upper Red Lake have been taking advantage of shuttle services out of some resorts to get them out on the ice. Other anglers are using snowmobiles, although they should begin plowing roads on the ice on both lakes very soon. Jigging spoons tipped with a minnow head have been working well for walleyes on most lakes. Anglers should use their electronics in the hole they are fishing, to see if fish are coming through and how they are reacting to the bait. Anglers can adjust their presentation based on how the fish react. A tip-up with a larger minnow or a dead stick with a bobber and lively minnow is a good choice for a second line, if anglers are not getting enough action from the rod they are actively fishing with sonar." - Paul A. Nelson, Bemidji Area Lakes Guide Service, panelson@paulbunyan.net - 218.759.2235 . (12/11) On Rainy Lake; A quick note from Chris Granrud, Rainy Daze Guide Service let me borrow his FB post that said; "Talked with a couple ambitious young men as they were "Lugging" off a big power auger after checking the ice conditions. It appears as though the ice on the bigger water did indeed sag with the weight of the snow. The depth of the snow is not as bad as it is closer to shore. A false layer of ice is forming out there under approximately 12-14 inches of snow. Closer to shore we had a better start to the ice, thus this ice has supported the snow creating more slush. All in all it could be worse. Allow "Mother Nature" adequate time to provide safe ice for any sled transportation at this point. Temps are very cold, but we will be having to form ice under a warm blanket of snow going forward. We could be okay in a week or so if we can avoid another dump of the white stuff." - Chris Granrud, RainyDaze Guide Service . Ice Fishing Report December 10, 2013 Jeff Sundin - The St. Paul Ice Show is behind us for another season and as usual, everyone at the River Centre, the show staff and all of the vendors staged a great show. Thank you to everyone who stopped by to chat and especially thank you for supporting the sport of fishing! Luckily, my ride back into the Northland was a bit less eventful than it had been for several motorists who made the drive home before me, on Sunday night. Along the route home, there were a dozen or so vehicles still trapped in snow banks and ditches. My heart went out to one particularly unlucky soul, who's pickup truck had found it's way into a creek at the bottom of a ravine. It was a good reminder to me that there wasn't anything going on around here that would have been worth one of those episodes. Besides, it gave me a great chance to spend an evening with one of the most beautiful women in the universe! The lakes I spotted along the way were just beginning to host ice fishermen. Portable shelters and dark houses were popping out everywhere, but not in large numbers. I didn't see much action on Lake MilleLacs until I reached Garrison. In the bay, there were about a dozen portables on the ice and a handful of permanent houses lined up along the bank, waiting to be moved onto the ice. From Garrison to Deer River most of the small lakes had a portable or two on the ice, but there's no sign of a crowd so far. I chatted with a friend who was spying on anglers at the East side of Lake Winnibigoshish. His comment was that there were "A Few" fishermen making their way toward the middle of the lake using snowmobiles. Since he hadn't talked with any of them, I didn't learn much about the ice conditions. That's gonna be my job for today. 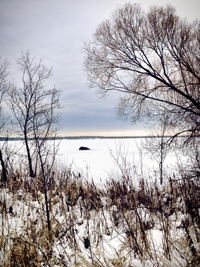 (12/10) Leech Lake Area Lakes, Gary Roerick Says; "Snow, Slush, and now the deep Freeze! December 8, 2013 - Well, this past week has been a meteorologists dream of active duty! We started the work week with daily amounts of snow each day, Monday to Thursday, with 3”-6” range each of those days. We went from very little snow last weekend to 12” to 18” in just 4 short days. Most lakes only had 3” to 8” of ice and then Mother Nature dumped a load of snow to cause flooding on all area lakes. Thanks to the severely cold temperatures, we now have the Ice Making Machine working overtime. This next week we will be seeing the low temperatures in the negative column each day. Generally speaking, the good ice is marginal on many of our smaller lakes. We now have lots of the slush freezing through from top to the bottom. We just need to give the ice and slush another week or two to develop itself in to some safer conditions. Walker Bay of Leech Lake and Kabekona Lake had just frozen over last weekend prior to the snow storm setting in. For many days this past week you could drive by these two larger lakes and you could visually see new areas of open water and/or excessive flooding that it caused the lake surface to turn a very dark color, showing complete saturation of all of the new snow with lake water from below. Those areas will freeze good, other areas will continue to have slush pockets throughout most of this winter. Despite the challenging weather that was dealt to us, we did have all of our spear houses rented out this past weekend with most customers spearing fish each day. The panfish activity has been slow, but consistent, with both sunfish and crappies joining us for dinner on several evenings this past week. Fishermen need to exercise caution during the next several weeks prior to venturing out on the ice! The excessive weight of snow on some very thin ice will potentially cause the ice to become unsafe to walk and/or drive on. I have seen and have heard of different people falling through the slush pockets with snowmobiles and with ATV’s to find themselves stuck and unable to move. I personally helped extract several fishermen that were pulling their fish house and supplies with a small 4 wheeler out to their favorite fishing spot, only to find themselves stuck in a heavy slush pocket that they fell in to, approximately 100 yards from shore. Don’t lose faith,…. the ice will get better, the temperatures will warm up, the fish will bite, and we will all soon be jerk’in more fish out of the ice hole! - Looking forward to seeing many of you out on “The Pond” soon!" - Gary Roerick Roerick Fish House Rentals 218-224-2836 . (12/10) On Lake of the Woods, Border View Lodge, Mike Kinsella wrote; "We have houses out! We are spread across 18 to 28 feet of water and fishing has been great! The forecast shows nothing over zero for the rest of the week. This is good as we would like to grow more ice. We have a foot of snow covering the lake. Billy Hildebrand from KFAN will be here broadcasting live on Thursday December 12th from 7 to 8 PM and Saturday the 14th from 6 to 8 AM. - FISH ON!" 1-800-776-3474 Border View Lodge . (12-10) Early Bass In Minnesota? An email note from Anglers For Habitat's, Vern Wagner - At the most recent DNR Bass Workshop, DNR fisheries officials announced that the rule making process has begun to create an early Bass Catch and Release season to coincide with the MN Walleye opener. This rule (Rule 10) also proposes to allow fall harvest of Smallmouth Bass in an area north of Hwy 53. Smallmouth Bass fishing after the second week of September is currently allowed, but the fall fishing is strictly catch and release. The new rules, aimed at allowing folks in the Boundry Waters Canoe Area to take a few Smallies for a meal, would also apply to Lake Vermilion and a number of other Northern Minnesota Lakes. If adopted, the new regulations would be slated to take effect during the 2015 open water fishing season. Regulation changes for catfish and sturgeon are in this rule package and Wagner added a personal note saying; "Of great interest to me is that the MN and WI DNR are conferencing on creating matching regulations on the border waters." Anglers for Habitat is a non-profit alliance of anglers dedicated to the preservation and improvement of aquatic habitat, clean water and fishing in Minnesota. Their $10.00 annual memberships are available by clicking >> Anglers For Habitat. (12-10) Progressive Tip-Ups and Tactics - Steve Pennaz; "Then a few pieces started falling into place. Why did suspended ‘gills seem to shy away from larger ice holes? Why did shallow-running pike seem to drop more baits than deep pike, particularly when fishing tip-ups? Did light have a bigger impact on fish than I realized? Or was movement the problem…the jiggle of a rod-tip or tip-up going off? Then last winter, while taping an episode of “Stone Cold Fishing” on Lake of the Woods, something happened that really opened my eyes. We were targeting giant pike with both live and dead baits on a shallow flat. We kept the baits high, just 2-3 feet below the ice in 8 feet of water. The first fish, a thick 14-pounder, hit a live sucker. The second, a bruiser pushing 20, took a dead cisco. In total we had eight flags that afternoon. But here’s the interesting thing…none of them came on a ... >> Read Article Progressive Tip-Ups and Tactics . 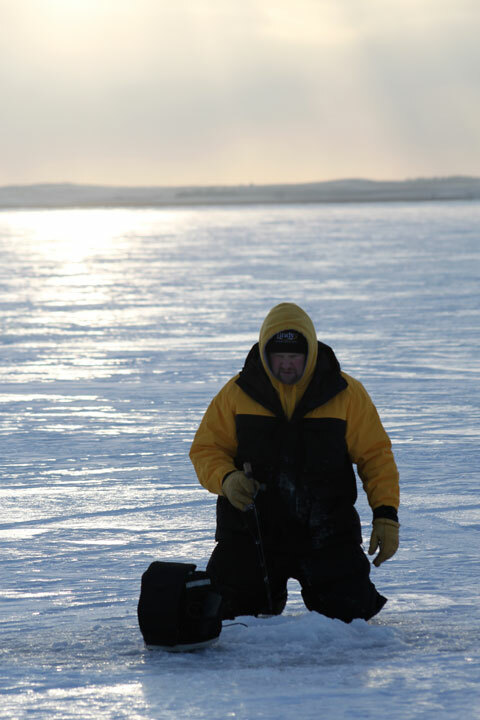 Ice Fishing Report December 8, 2013 Jeff Sundin - Ice Conditions Better Than Expected - Among the ice fishermen that I've spoken with at the St. Paul Ice Show, consensus is that anglers have access to good ice, right now. On Saturday, a quick note from Lake Winnie Ice Fishing Guide, Ryan Peterson says; "I Just came off the lake and it's not as bad as I thought it might be. Made it all of the way out to 25 feet of water with my ATV and only encountered one small slush pocket. On the South side of Winnibigosh, there was 8 inches of ice, everywhere we measured. Hopefully, by mid week we'll be able to start some light plowing to get the roads started. Ice Fishing Report December 6, 2013 Jeff Sundin - Ice Conditions, Piecing It All Back Together - Okay, after three days of snow and one day of blowing, the brezze settled and the deep freeze temperatures set in. It's -8 degrees right now and the sky is clear. With any luck at all, this will help bridge the gap between the surface of the ice and the top of the snow cap. It's this gap that causes all of the trouble. The snow insulates the ice from sub freezing temperatures, preventing the water from freezing solid. That's how the water forms a layer of slush that is not only annoying, but can be downright deadly. Most all of the rental operators in the Itasca area, used Tthursday to assess the situation, waiting to see if the high winds would help out by moving some of the snow away from mid lake surfaces. It's likely that there won't be a lot of change until early next week. Many of the ice operators and guides are going to be downtown St. Paul for the Ice Show. Others will be waiting to see if the ice forms fast enough to allow them to do some light plowing. There will be a lot of buzz down at the show and I'll be updating the reports each morning before the show opens, so please stay tuned for more . Ice Fishing Report December 5, 2013 Jeff Sundin - Ice Conditions, Predictions Remain Cautiously Optimistic - Okay, after three days of limping around, plowing snow away from the same three spots, I'm finally seeing a light at the end of the tunnel. One more session in the plow truck and then I'll be able to get back up to speed about ice conditions. Everyone else has been in the same boat (so to speak), so talking about fishing has taken a back seat to dealing with the snow storm. The handful of folks that I have talked to, all seem to think that in the long run, this won't be as bad as it looks. As a natural born optimist, I hope that turns out to be true. My own plans for today got changed, so later this afternoon I'll be able to get a first hand look at some of the lakes and see how conditions look for the upcoming weekend. During all of the commotion, I almost forgot to mention that my UPS driver slipped a package into the back porch. OH Man! My 360 Jigs and Tungsten Toads are here! Now I can get out on the lake and take those 360 jigs for a spin! Ice Fishing Report December 4, 2013 Jeff Sundin - Ice Conditions, Predictions Remain Cautiously Optimistic - The weather was nice enough, the conditions were good enough, maybe I'll wish that I'd played hooky on Tuesday and gone hunting. But the snow, although lighter than before, was still coming down and knowing that I had this one last opportunity to get the yard in order before the "Real Winter" sets in, kept me focused on work instead. There were some ice fishermen out on the ice though and fishing reports were far from gloomy. So far this season, the fish have been more than cooperative and it doesn't seem to matter what you're fishing for. Walleye and Crappie fishing have captured the attention of many anglers in the Deer River area. (12/4) Grand Rapids Area Fishing Guide, Grant Prokop began his ice fishing season with a great afternoon. Grant said; "I was out on a deer river area lake and did pretty good. Was sitting in 17 feet of water off a point on a break line off of shore. It didn't take long for Layla my dog and I to get busy. From 4 to 6 in the afternoon we had non stop fish coming through. Ended up catching 8 and while still getting a little rust out, missed a lot too. There was 6 inches of ice. You could see two spots that we're slush but they weren't in my path. Heavy and wet snow definitely made it difficult to walk a sled out. But other than that, conditions were good!" Note: Grant added a snowmobile and a couple of new ice fishing shelters this winter and he plans on doing some guiding for ice fishing. 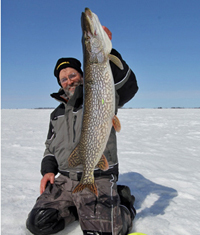 >> Inquire about Ice Fishing Trips here . (12/4) Grand Rapids fisherman Mark Colter sent a quick note. He says; "I have lots of slush in front of my house on Pokegama. But -20 degree temperatures this weekend should freeze it back down. Going to be really cold for the next week or better and that's good, but ugly." Ice Fishing Report December 3, 2013 Jeff Sundin - Ice Conditions In Jeopardy? - Will snowfall set us up for another winter of slushy ice and poor travel conditions? Or will we dodge a bullet? It's too soon to tell. There are times when nothing else will do except for the facts. The problem is that the story is still unfolding, the snow is still falling, even now. In the Deer River area, snow fell steadily throughout the day on Monday. It wasn't piling up real fast, but there was enough snow to force me into making my first concession to winter. A day spent in the old plow truck, performing space management was the last thing on my bucket list for a Monday. But, that's the way it turned out. The good news is that it still hasn't piled up all that high. There may be 6 inches here, add a few where the wind has drifted it. That's enough to get your attention, but not necessarily enough to ruin the ice, especially on lakes that already had a really good head start before the snow started. Comparing this storm to the first snow of last year; I recall that we were further behind the curve in terms of ice thicknesses. The snow that fell, landed on thinner ice, producing a real mess. In fact, I checked the archives and a year ago, we were still looking at open water! Yes, really, see for yourself, click to jump back >> Ice Fishing Report December 5, 2012. In other words, that means that it's not too late for us this winter. We may dodge a bullet if the snow stops today, before getting too much deeper. After that, we have a massive cold snap headed our way for the weekend. With below zero temperatures, there will be some new ice forming for sure. For today, I'll be cleaning up the snow that we have on the ground and then taking a tour of the area to see how conditions are shaping up. (12/3) On Bowstring Lake, Erin at Geiger's Trails End Resort checked in with a quick note; "Snow is falling and the ice is thickening. There have been a few brave soles out on the ice. We are getting ready for the up-coming season. We are noticing a crack that is going across the ice from the point over to the North Access. Hopefully it will seal up and not heave up. There is about 5 inches near the Northwest access and 7 Inches near the North Access. However, we are getting more snow. So, please be careful out there. Check out our Ice House Care Package, Our Group Rates for 5 or more Fisherman, and our upcoming events. Don’t forget about our pizza specials and delivery during this season." - Erin and Bill Charlton, Trails End Resort . (12/3) Bemidji Lakes Area, Paul A. Nelson, Bemidji Area Lakes Guide Service says; "Lakes in the Bemidji area have been making good ice so far this year, but an early winter snowstorm may cover many of the local lakes with a foot or more of new snow. Ice anglers hope that the ice on the lakes is able to get thick enough early in the season before a heavy snow falls on the lakes. 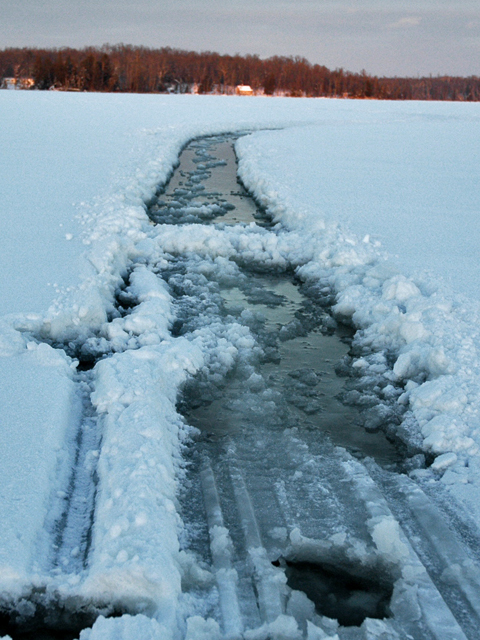 An early snow can impact the ice conditions for most of the winter if too much snow falls on the ice before the ice is ready to hold the additional weight. All snow is not the same when it comes to water content. Some snow is wet and heavy, while other snow can be light and fluffy. The water content of the snow determines how much the snow weighs, which also determines how much the snow effects the ice conditions. 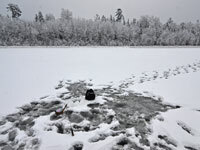 Anglers have started to fish many of the area lakes, with most lakes having enough ice for anglers to walk on the ice. A few of the shallow lakes already have enough ice for ATV’s and snowmobiles. Upper Red Lake is almost always the first lake to have a significant amount of ice fishing pressure early in the winter. Most anglers have been catching walleyes along the shoreline break in 6 to 8 feet of water in Upper Red Lake. Most anglers have been using jigging spoons tipped with a minnow heads for walleyes. Anglers can also use a bobber rig with a lively minnow, but it is usually more productive to fish one line with sonar, so anglers can watch for fish coming through as they fish. It is too early to tell what impact the snowstorm will have on the ice, so anglers planning to fish the lakes in the Bemidji area may want to call ahead to their intended destination to check on the ice conditions or ask at the bait store before going out on the ice." - Paul A. Nelson, Bemidji Area Lakes Guide Service, panelson@paulbunyan.net - 218.759.2235 . 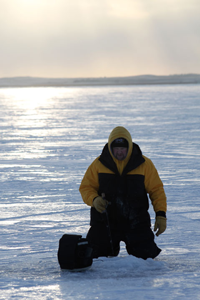 (12/3) The Leech Lake Area's Gary Roerick Says; "Spearing or Angling, now is the time! December 1, 2013 - Welcome to another season of Hard Water Fishing and Spectacular Spearing opportunities! I now have 6 of my spear houses out on area lakes. The ice conditions at present time are looking great! The ice thickness on smaller lakes and on many of the bays of larger lakes this past weekend were in the 5” to 8” range. You need to monitor the weather conditions during the upcoming week. The meteorologists are saying several days of snowfall followed by some very cold weather. The high temperatures in the Walker area for several days this week are predicted to stay in the negative column! The fishing this past week has been phenomenal! Friends are reporting lots of fish being caught, the largest walleye reported was 29” in length. I personally found a little time to do some spearing on the weekend and saw an average of 1 northern pike every 30 minutes. I speared two fish on my first outing of the season and yes, we did have fresh fish for dinner! We are also seeing and catching a variety of panfish while we are spearing. As always, please use caution when you venture out on the new ice. Make sure that when you are exploring new fishing locations you test the ice thickness by chiseling or drilling test holes to ensure that you have enough ice to safely move around to your favorite fishing spots. You should reference the MN DNR literature on “Recommended Minimum Ice Thickness” for some rough guidelines for new clear ice. Generally speaking, you should have a minimum of 4 inches for walking on, 5 inches for driving ATV or snowmobile, 8-12 inches for small cars or small pickup trucks, and 12-15 inches for medium sized pickup trucks. Oh yes, don’t forget those ice cleats for walking out on the ice as the frozen lake surface is currently glare ice. Ice Fishing Report December 2, 2013 Jeff Sundin - Ice Fishing Opener Just In A Nick Of Time! - The weekend crowds were larger than usual and the fishing was above average. Better than most folks expected, even for "Early Ice". Conditions couldn't have been much better; Warm outside temperatures, plenty of solid ice for walking and very little wind. All of the anglers who ventured out this weekend ought to be counting themselves lucky, because soon, the ship is gonna hit the sand! The weather that rolls in over the next few days will shape the image for the entire winter. A little bit of snow won't hurt much now. In fact, it could be "good for business", especially for folks who depend on snowmobiling, plowing and shelter rentals. If we really get dumped on though, that would be a whole 'nother story. I don't think that many of us would be looking forward to a long winter of deep snow and slush like we had last year. The critters don't need a winter like that either, so lets all say a collective prayer that this storm doesn't pack too big of a wallop. On the other side of this snowfall, predictions of single digit daytime high temperatures are gonna get the ice machine going again. A good, thick sheet of ice would be good news and could really help shorten the winter, mentally, that is. 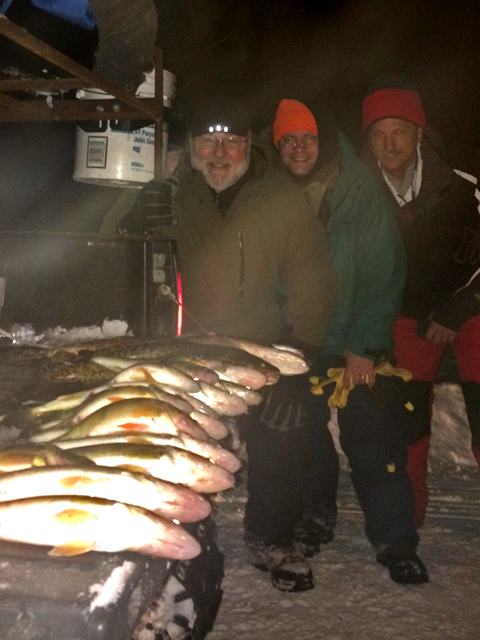 (12/2) From The Iron Range, Greg Clusiau; "We ended up cooking a bunch of nice Walleye on Friday, our first night there. These fish are extremely healthy and with a limit of four fish under 20" it makes for very nice bunch of fish to take home. 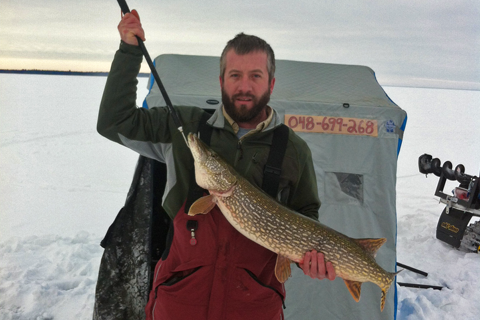 The ice measured at 8" and we fished about a... " >> Read Greg's Full Report . Ice Fishing Report December 1, 2013 Jeff Sundin - Happy December! - Only a few days into the ice season, reports of solid, safe ice and good fishing are coming in from both North and South. On Saturday, it was almost enough to distract my pal Matt Mattson and I away from our mission, but not quite. The Minnesota Muzzleloader Deer Hunting Season opened yesterday too. Over the years, that's become kind of a big deal for us guys, so even with Matt's phone chirping out a steady stream of tempting, "teaser texts" from his Walleye fishing buddies who were up on Red Lake, we managed to stay focused on the forest. The Deer were more than cooperative, at least in terms of allowing us to spot them. After spending several hours scouting for new territory, we finally stumbled into some. A fresh clear cut, revealed lots of Deer tracks. Some of the better tracks still had Deer standing in them! Matthew's smokepole must have been distracted though. Maybe it had fishing on it's mind? Because it had a little trouble tossing the bullets in the proper direction. Maybe we lacked the guidance of our absent, but not forgotten muzzleloader partner and head ramrod, Arne Danielson? Surely, he would have coached Matthew, calmed him down and set his mind toward focusing on the shot(s). Either way, it didn't matter. We set out in pursuit of Deer, we saw Deer and had multiple opportunities to bag one. Add to that, a beautiful day, warm temperatures, calm wind and plenty of warm memories to occupy one's mind. Not a bad way to spend the last day of November, not bad at all. (12/01) Meanwhile, out on the lakes, the fish were active. 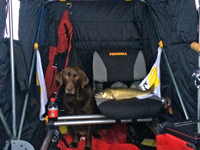 Matt's pals, the one's that were fishing on Upper Red Lake, reported plenty of Walleye action on both Friday and Saturday. They were fishing the shoreline breaks in about 7 feet of water and reported ice thicknesses of 7 to 8 inches. They mentioned that were some ATV's out there, but few, if any, Rangers or small vehicles. Other reports from anglers on the gigantic lake were good too. As you'd expect, jigging presentations were best during the morning and evening hours. Dead sticking with live bait gave anglers an edge during mid-day. Crappie fishing was getting the attention of anglers closer to the Grand Rapids area. Reid Ylitalo and his father have been spending the weekend searching for fresh Crappie territory and judging by the pictures, have apparently been finding them. In defference to the eploratory nature of their mission, I didn't probe for details. Sometimes, just knowing that conditions are good, is enough to trigger some ideas of your own. Fishermen, Lurenet will lead you dozens of the best lures and fishing tackle and it's all in one place! >> Lurenet . Photo courtesy Grant Prokop; Lake Winnie Walleye structure topped out at 24 feet and that the fish cruised in an out for most of the day. Jigging spoons tipped with minnow heads was the best presentaion and the typical morning and evening pattern was best. There were periods of daytime action too. Panfish fanatic Paul Fournier knows the drill. Tackling pressure-cooker crappies give in to his finely tuned tactics that include a blend of pre-trip recon and refined fishing strategies. 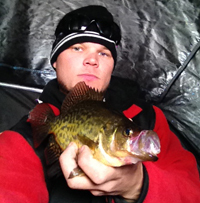 Read the article and learn to entice ice slab Crappies that elude other anglers. >> Pressure Cooker Crappies . Photo Courtesy Grant Prokop: Lake Winnie Walleye were on the prowl for Christmas. An after afternoon bite on mid-lake structure started early and strong, but fizzled early. Photo courtesy Austin Jones: Who received a Christmas afternoon fishing gift whe he discovered a mixed bag of Crappie and Walleye on the breakline from 18 to 22 feet. Crappie were suspended, holding about 12 feet below the surface. Walleye held deeper, hovering just above the bottom in 22 feet. First, I selected a spot that lies along the breakline, at the tip of a slow tapering point. I used Contour Elite's 3D feature to help visualize the structure from several angles. That will help ensure that I drill my holes in the right spot, the first time. Higher - Dryer. Ice conditions continue to improve, especially on lakes that flooded early. A long, dry walk on this Deer River area lake led to only one small patch of slush. All gasoline, whether it’s blended with ethanol or not, will degrade over time due to evaporation, contamination and oxidation, according to Brian Kluge, Mercury Marine’s director of parts and accessories. However, ethanol can exaggerate this. Click for the full story >> Ethanol and Your Marine Engine, What You Need To Know . 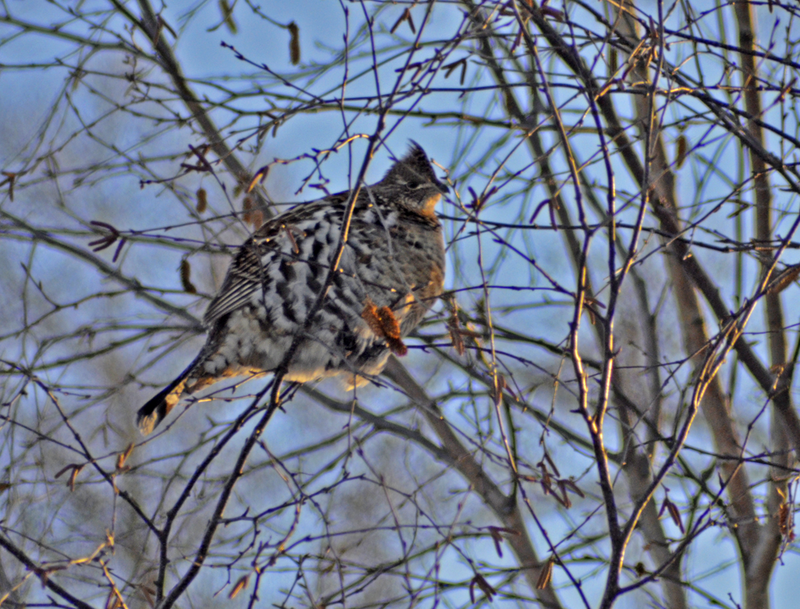 Photos courtesy Zach Dagel, Grand Rapids Guide Service. Walleyes are active at twilight on deep, late freezing lakes. Above: Caden Carpenter, Below: Jake Kangas showing off their handywork. It’s Lund's legacy of free-spirited thinking that has resulted in their newly redesigned >> 1800 Rebel XL . Photo Courtesy Sportsmans Lodges: Mercedez Stangland with her 29 inch Lake of the Woods Walleye. Early ice has been good and reports of 100 fish days from anglers are common right now. Early Ice on Lake of the Woods? Hey, I've told you before, it's one of those spots ya just gottavisit! Jon Telen shows why in this video. Click >> Early Ice Fishing Walleye on Lake of the Woods . Merry Christmas! 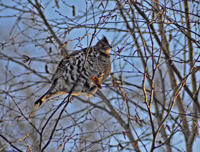 A Partridge in a ... Oh I know, it's not a Pear Tree. Don't be a scrooge, just click and get your high resolution Christmas Gift! Want an even bigger image? All ya gotta do is ask. On Bowstring Lake, Bill Charlton has started the early makings of a road onto the main lake. It's not ready to use yet, but every inch of new road freezes fast and it won't be long before it's time to head toward Geigers Trails End Resort . From Our FB Page - Photo courtesy Ryan Paulson: Dulth area lakes have consistent ice thickness of around 15 inches. There are some slushy spots, but overall, conditions are good. There once was a man with "Plan A", But slushy tracks ended his day. Now on to "Plan B", on foot it will be, please don't let us wind up in "Plan SEA". Experienced back woodsman Tom Batiuk of Ft Frances, Ontario with a nice walleye. Batiuk’s winter preparedness allows him to reach prime fishing hotspots scattered across Rainy Lake and more. 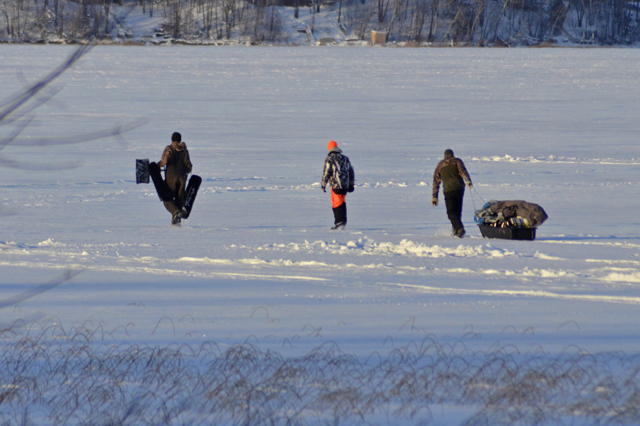 Young anglers hoofing to their fishing spot, found that walking has become easier on top of the crusted snow. By the way, the one in the middle? Buy stock in his company. He appears to have the knaack! On Deer Lake, I noticed that someone had cut themselves a spear house hole. The slab of ice laying on the surface was about 6 inches thick and it looked fairly good. The problem is that the hole was cut in the area that froze early, before the heavy snow. Few crappie hunters consider spoons their go-to lures, especially under tough-bite conditions. That’s a shame, because these metal masterpieces work wonders throughout the hardwater season. Read full article >> Spoon Feeding Winter Crappies . If you have an ice fisherman on your Christmas list, then this is one gift that I guarantee will be a hit! Cold Snap Outdoors "Snap Cap" takes all of the hassle out of protecting your auger blades. Air Assault on Crappies? It is for this Kenora, Ontario, based guide, Dave Bennett. Watch the ice fishermen find 'em from the plane, then land it and catch 'em. 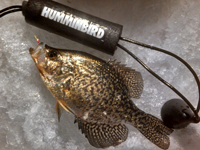 Click for the video >> Humminbird's Bush Pilot Crappies . A nice surprise for Ben Alrick, Kasson MN. The 36-1/2 inch Northern Pike had a swwet tooth for Ben's Perch bait while he was fishing on Lake Winnie. Buzz about Lindy's 360 Jig continues to heat up. Thanks to Jon Thelen who's been out on Devils Lake putting it to the test. There's a new video, hot off the press, that shows how to use the 360 Jig. Click here >> How to fish Lindy's 360 Jig . Photo courtesy Spenser Samplowski: (12/12) An un-lucky Lake Bemidji angler found out the hard way that the ice isn't ready for vehicle traffic. Deer River area bait dealers produce video that illustrates Spottail Shiner minnow harvesting. 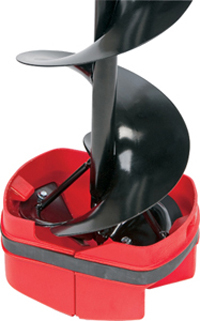 Take a full tour from the lake to your bait pail and everywhere in between. (12/9) Here it is, the first Fish Ed episode of the new season. Host Jon Thelen ventures onto the ice in central North Dakota Ice Fishing for Jumbo Perch and Walleye. Pennaz was targeting giant pike with both live and dead baits on a shallow flat. "We kept the baits high, just 2-3 feet below the ice in 8 feet of water. In total we had eight flags that afternoon. But here’s the interesting thing… Read Full Article >> Progressive Tip-Ups and Tactics . OH Man! Lindy's 360 Jigs flew off ot the shelves at the Ice Show this weekend. Don't worry though, there's still plenty of them, the 360 jigs are stocked up in sporting goods departments everywhere. Photo Courtesy Grant Prokop: Fishing on a shoreline break over 17 feet of water. Walleye action was good from 4 to 6 PM. 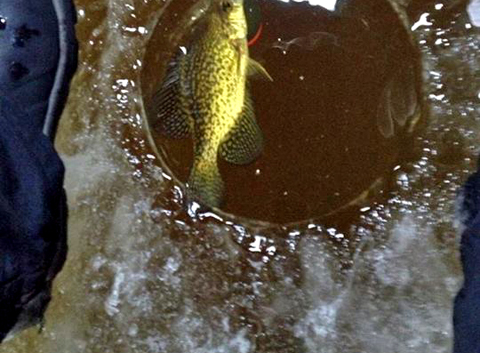 Photo Courtesy Reed Ylitalo: "We found 6-1/2 inches of ice, a large school of Crappies and plenty of fun". Read >> Ylitalo's Grand Rapids Ice Fishing Report . From the archives; December 17, 2012 - Thin ice, water and wet snow cover had combined to produce slushy conditions. For this season, ice conditions are already better than they were then. Could we have dodged a bullet? What's This? Click Here To Find Out . Fishermen on your Christmas shopping list? Click here and you will find them a great gift! 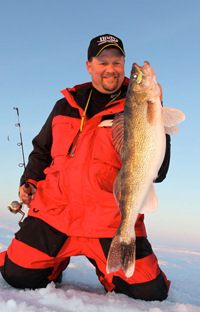 We’re targeting early winter walleyes shortly after Upper Red Lake’s surface has solidified. 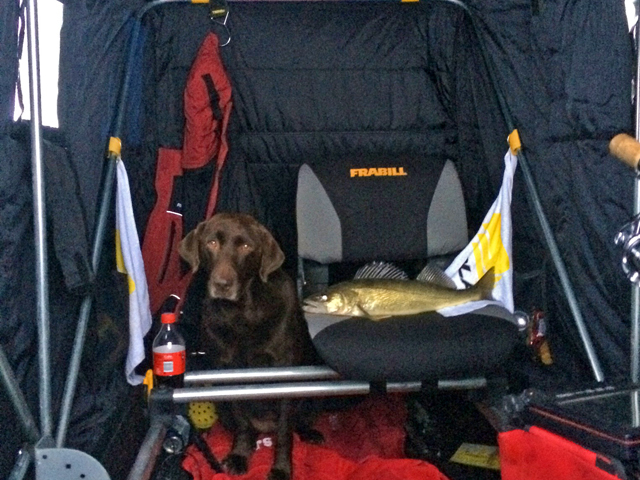 Shallow and relatively featureless, Upper Red is still a hot spot for early ice Walleye. 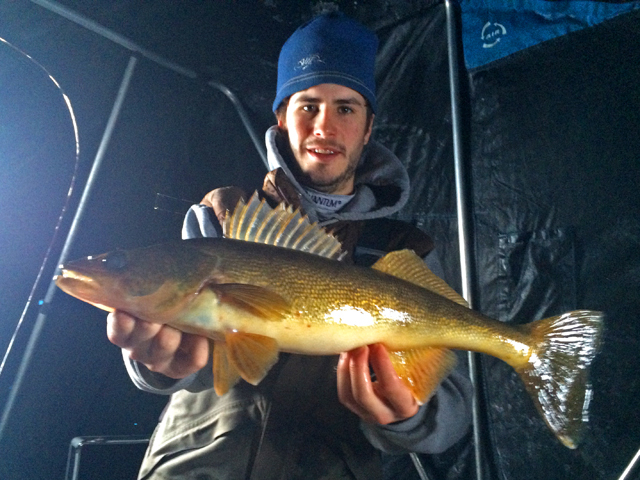 Read >> First Freeze Walleyes On Featureless Lakes . Photo courtesy Greg Clusiau: Walleye expert Ray Welle, "Blade Man" poses with a nice Upper Red Lake walleye before easing it back down the hole. click to >> Read Greg's Report . Photo courtesy Grand Rapids Area Fishing Guide, Reed Ylitalo: Reed and his father have been spending part of the weekend searching for fresh Crappie territory. Photo, Fred's Bait, Deer River: Perch and Pike occupied Billy Maki's time until he and Bill Powell "Had a short flurry of Walleyes at sundown". Jesse Aultman and his crew reported 5 to 6 inches inches of clear, solid ice. 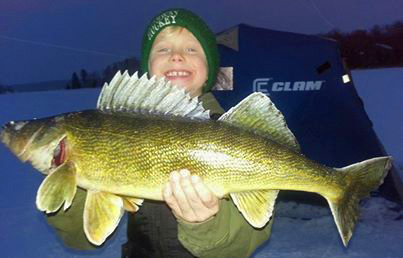 Even better, by the time I spotted them, Jesse already had a couple of Walleyes flopping on the ice. A good way to kick off the ice fishing season!